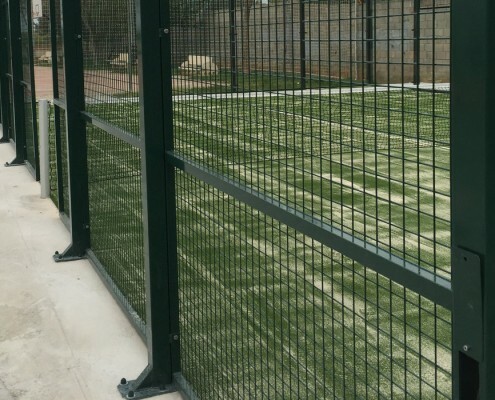 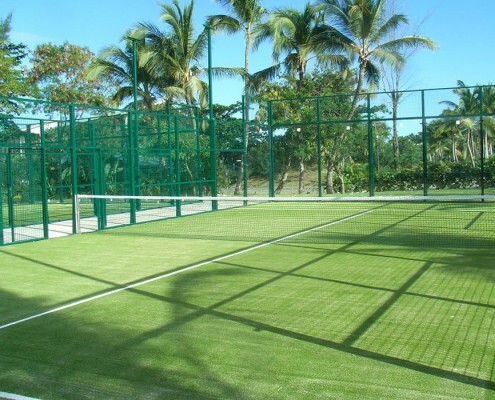 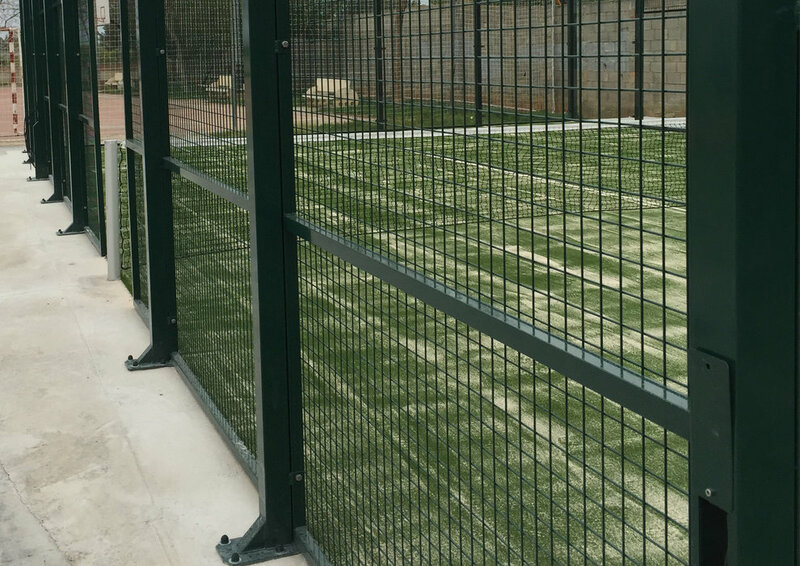 At EliGrass, we believe that the playing surface is very important, therefore we work hard with the best manufacturers with the best products on the market; while installation and maintenance is always carried out by our specialist fitting teams. 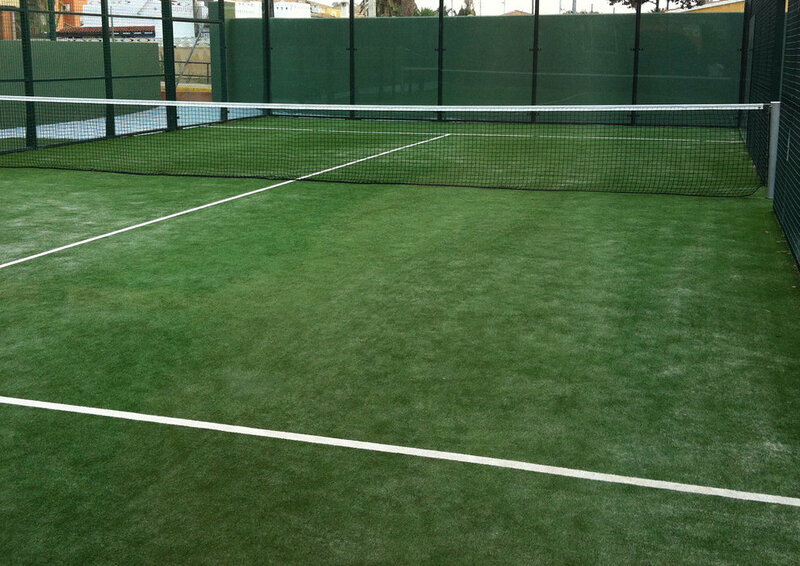 * Acts as ballast for the surface material and keeps the fibres vertical. 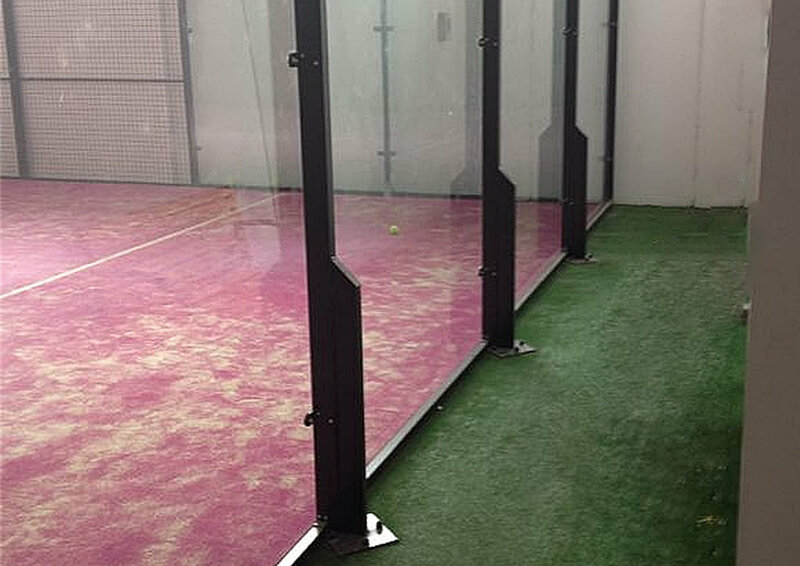 ** Coloured sand available for those clubs who wish to have the sand and surface to be the same colour for better visibility during the game. 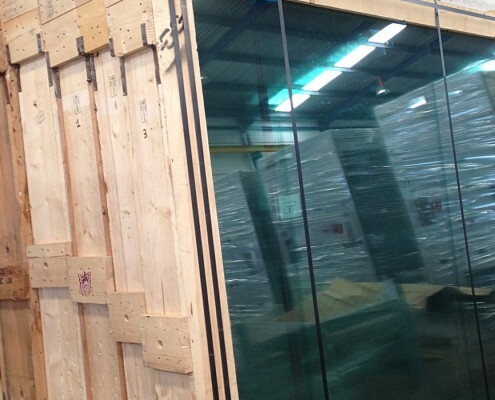 We recommend using a colourless, tempered float glass of 10–12 mm thickness. 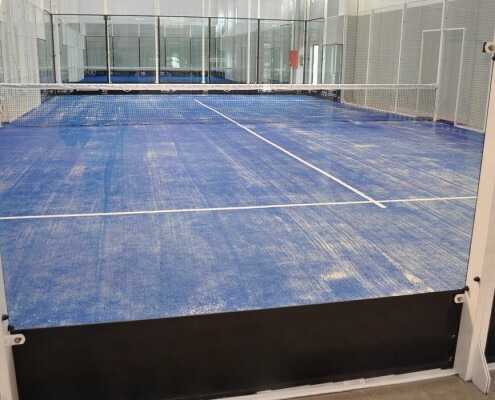 However, the thickness chosen depends upon the wind pressure to be withstood, according to the geographical location of the court, as regulated by the Technical Building Code (CTE), and whether the court is indoor or outdoor. 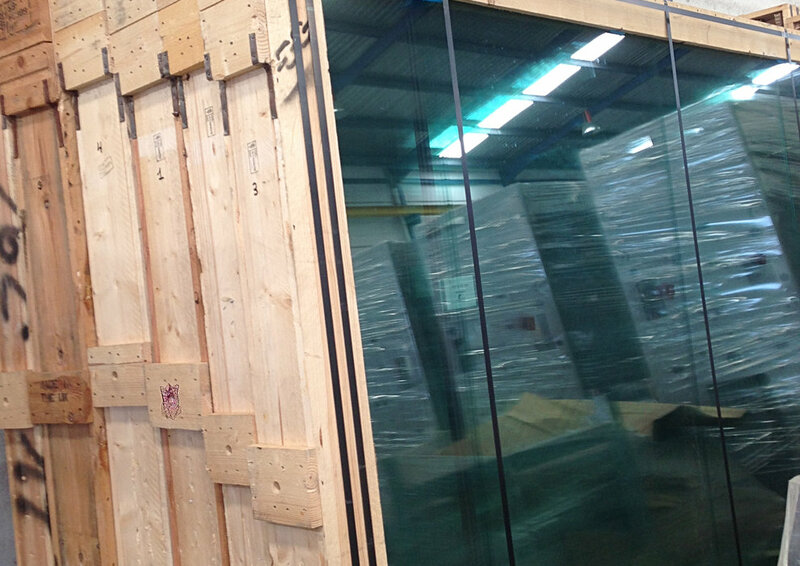 Laminated safety glass of 8+8mm and 10+10mm thickness can also be used, but in this case, the glass cannot be drilled. 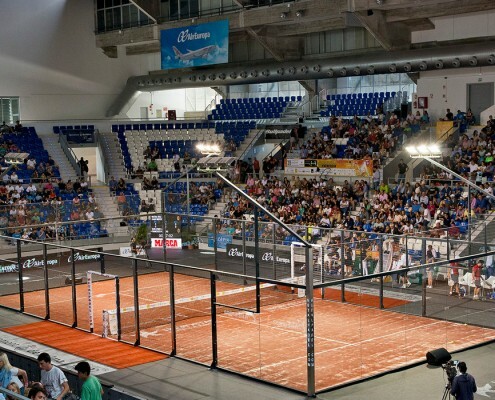 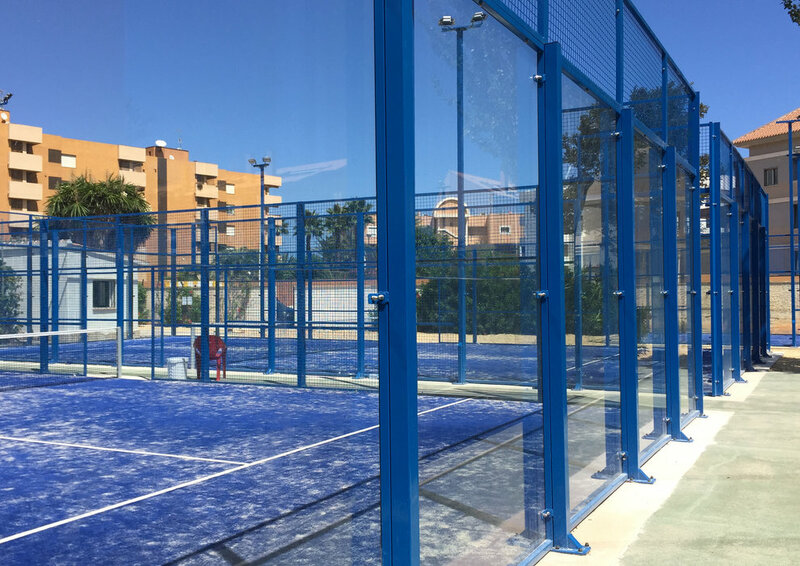 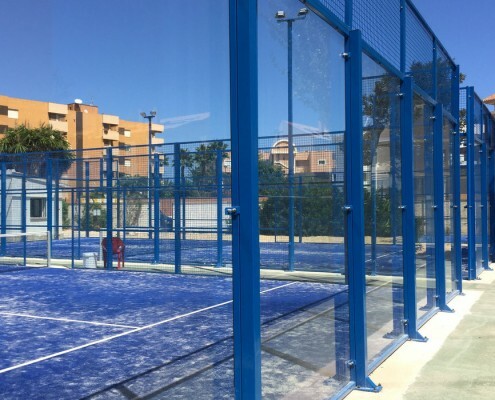 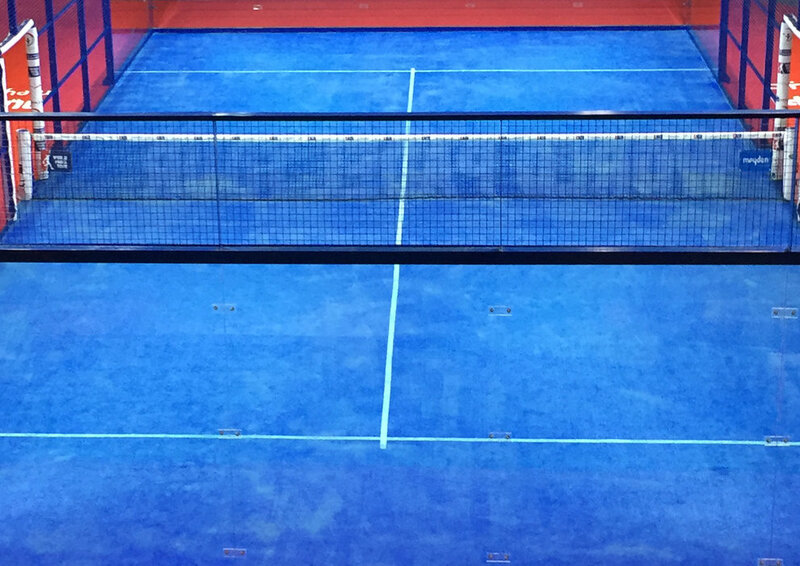 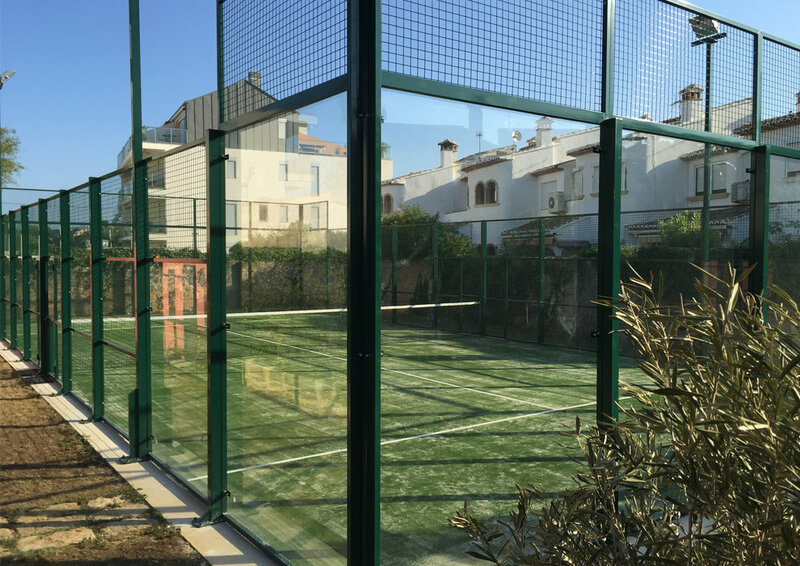 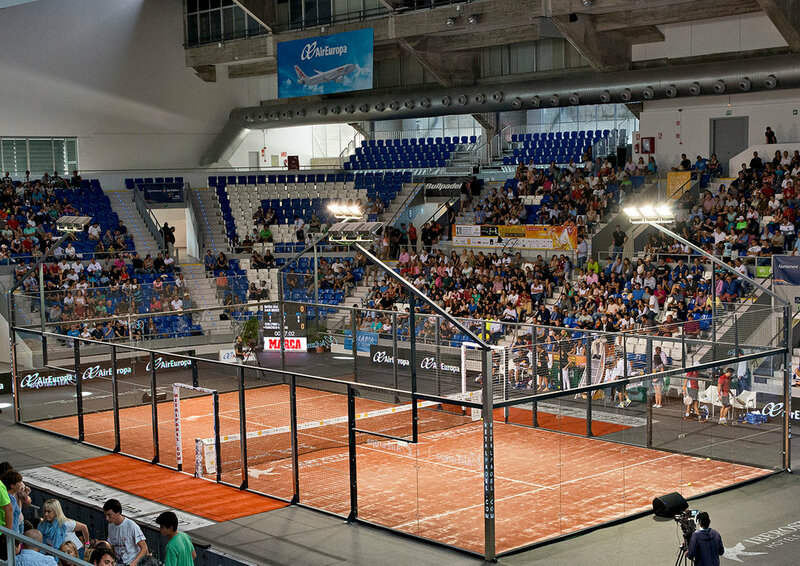 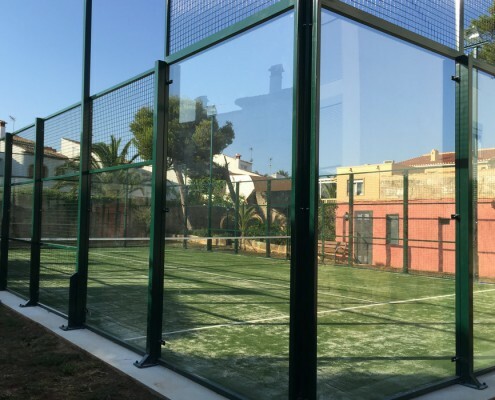 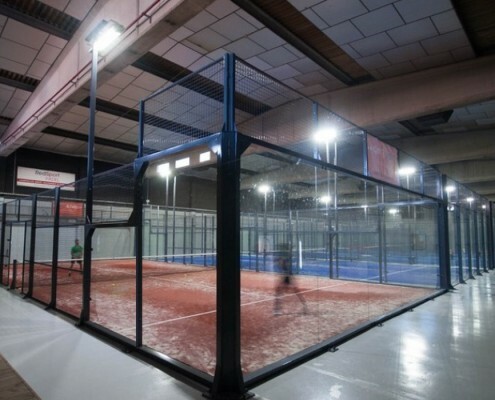 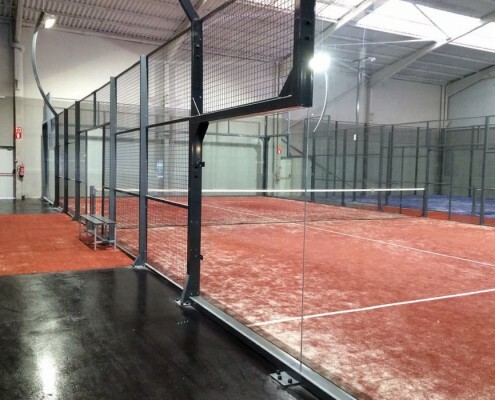 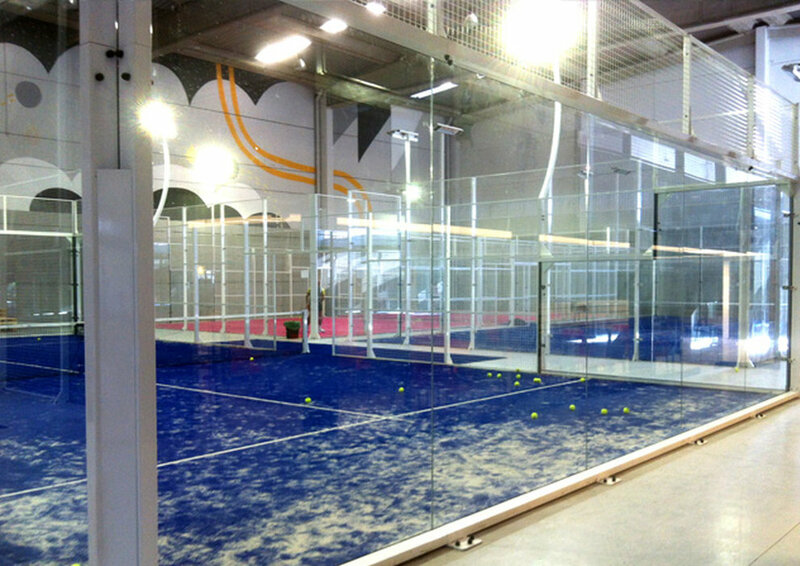 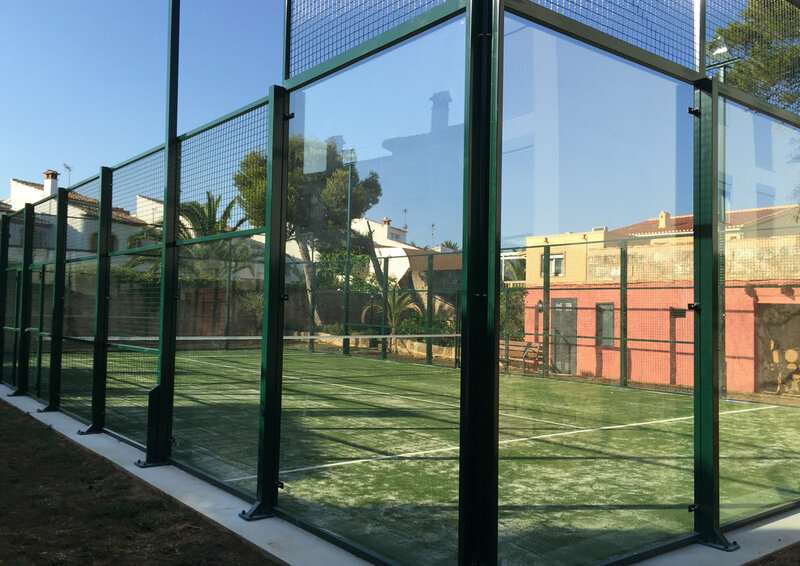 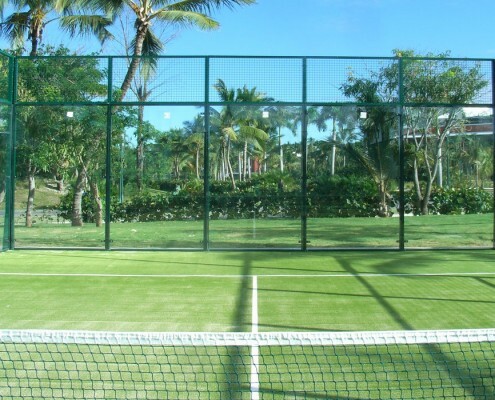 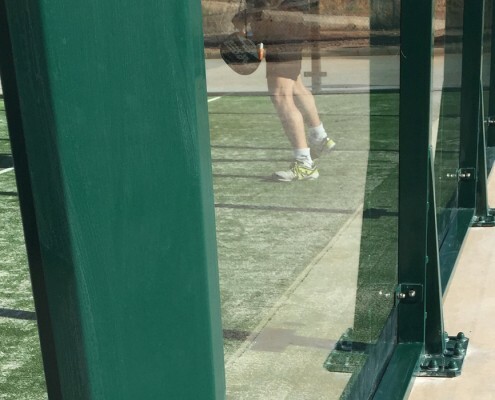 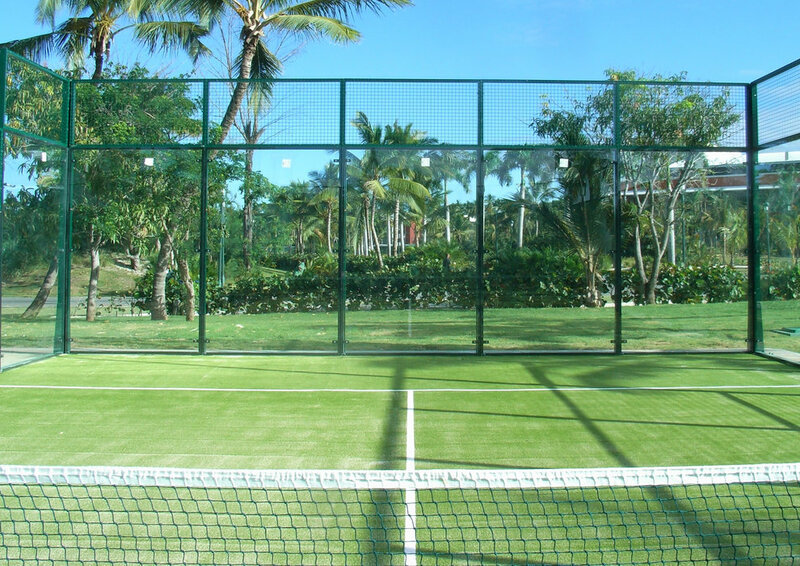 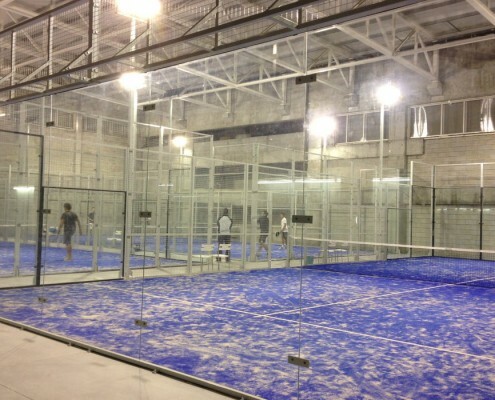 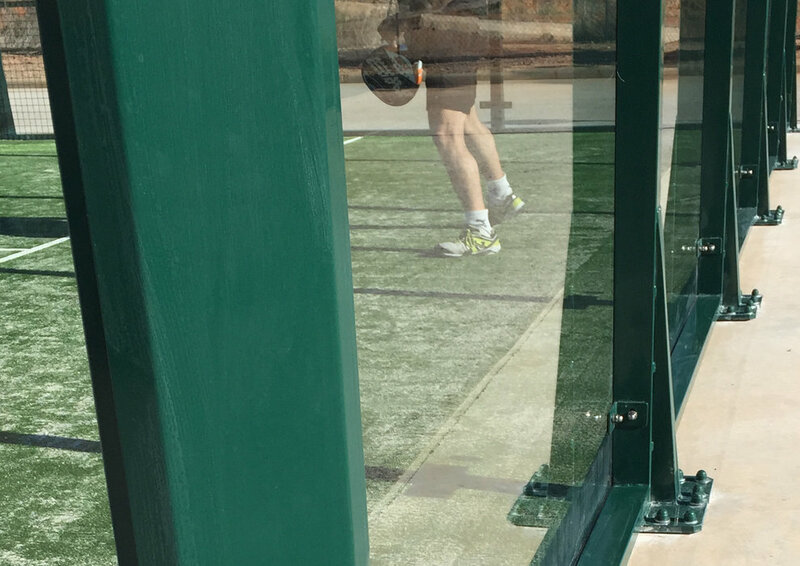 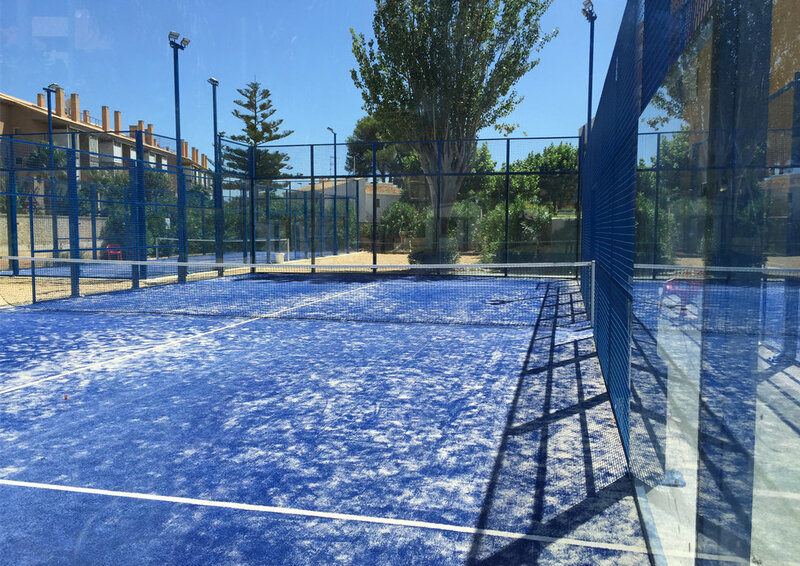 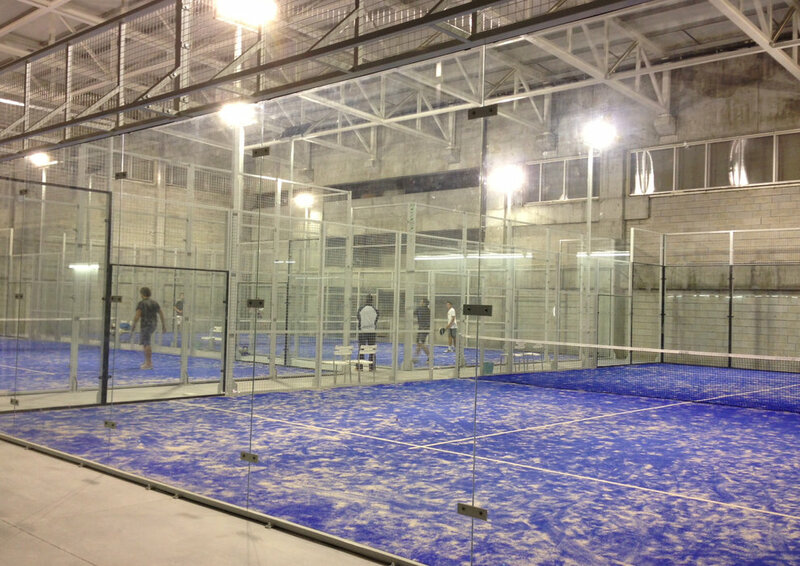 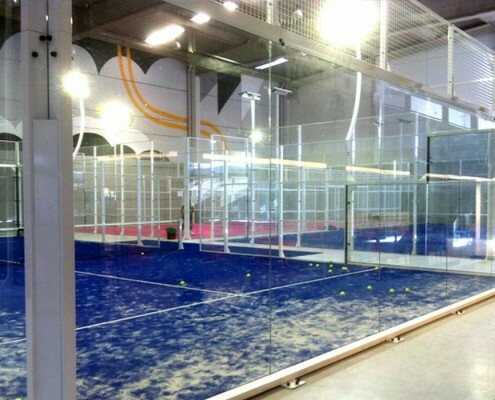 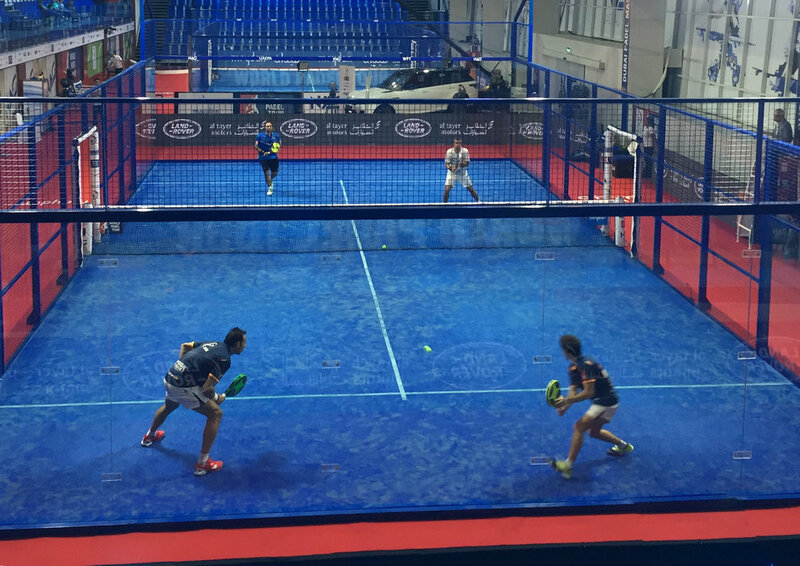 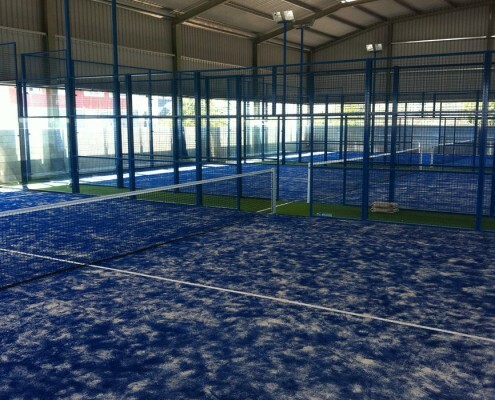 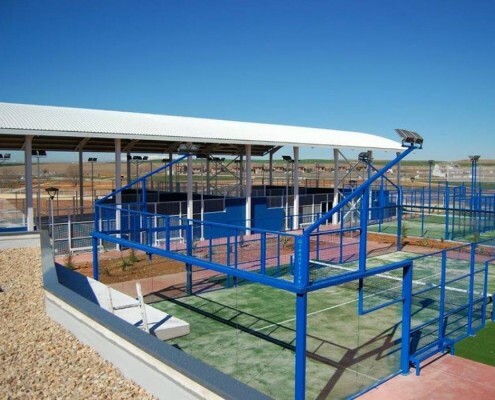 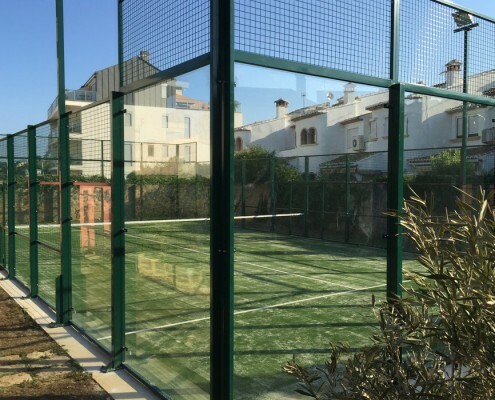 A padel tennis court consists of 18 panes of flat glass with polished flat corners and seamed, shiny edges which are properly aligned and optimally fitted together 14 measuring 2x3m (6 countersunk holes) and 4 measuring 2x2mm (4 countersunk holes). 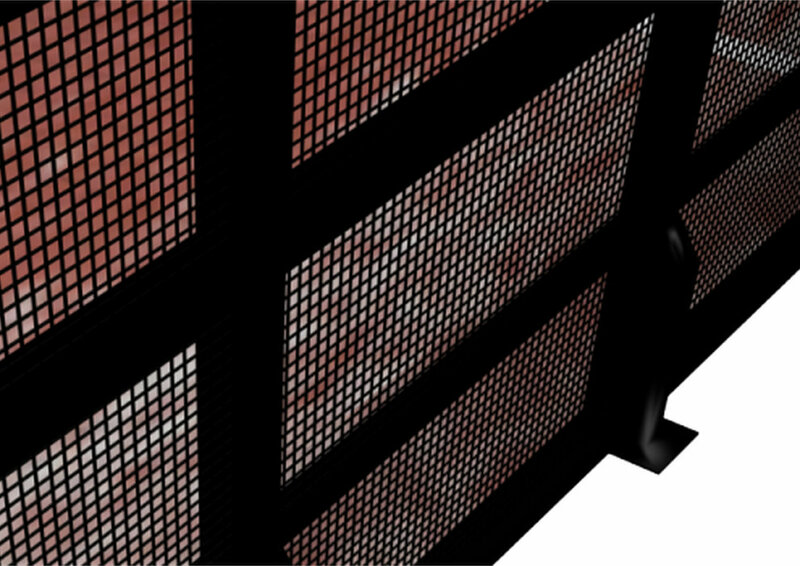 This is a pillar-based model. 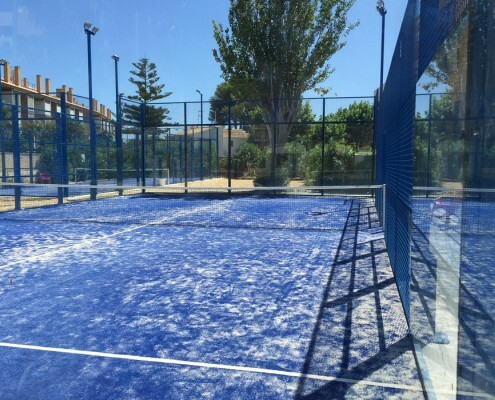 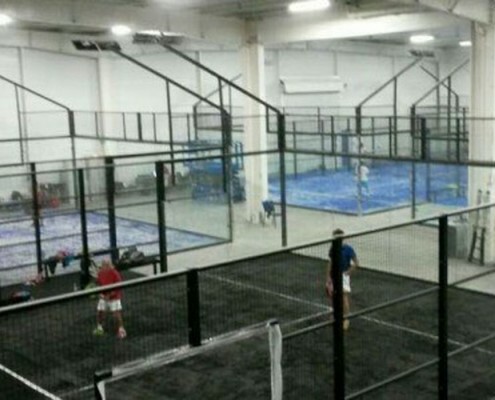 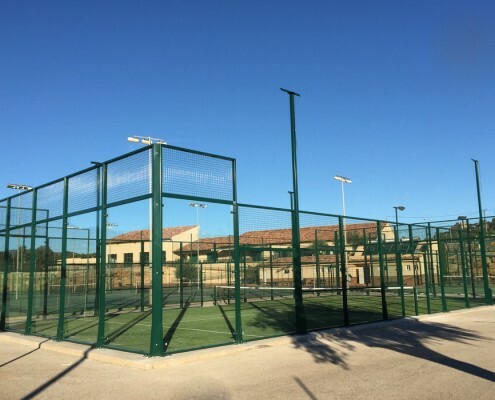 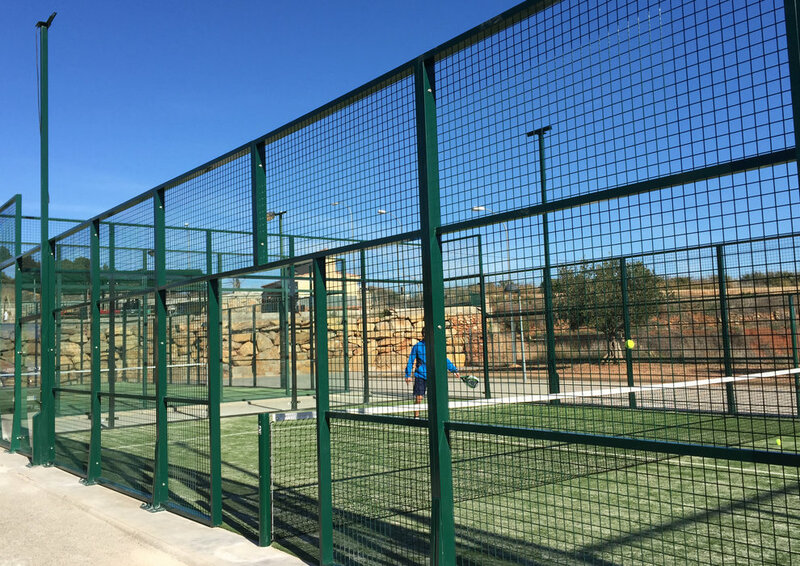 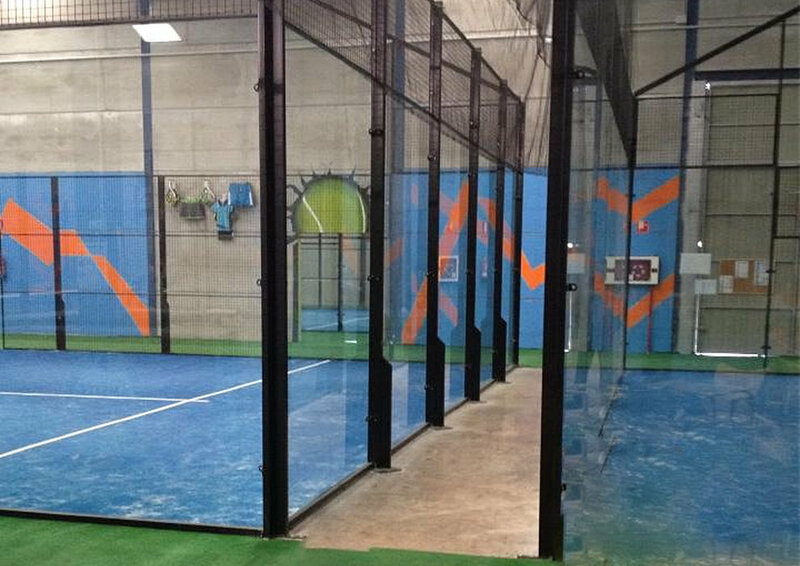 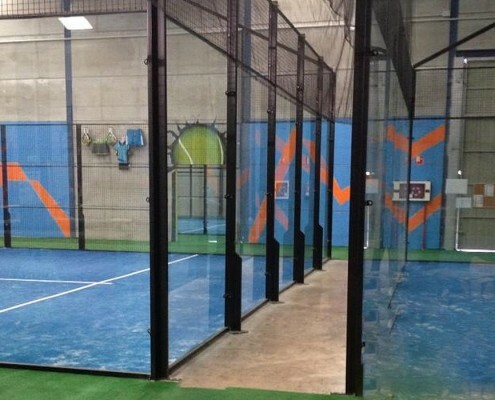 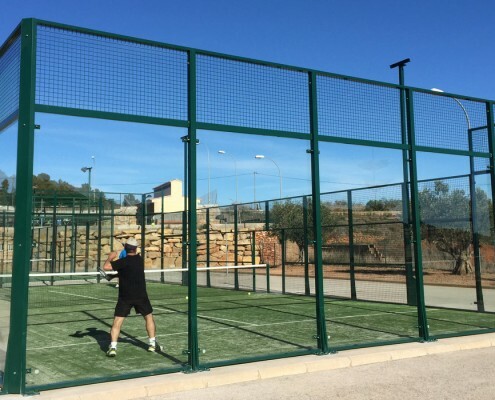 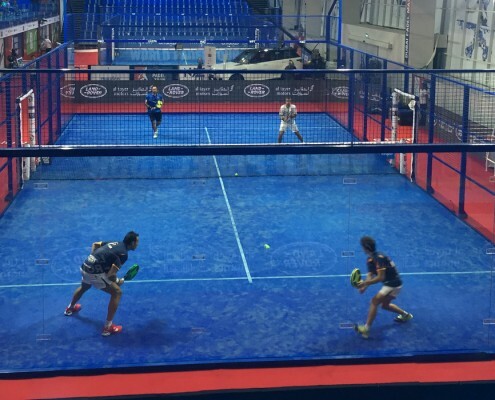 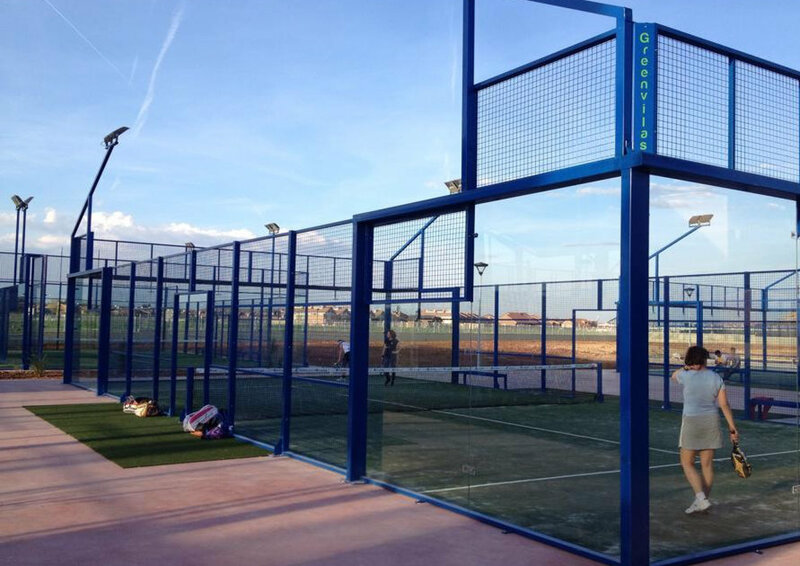 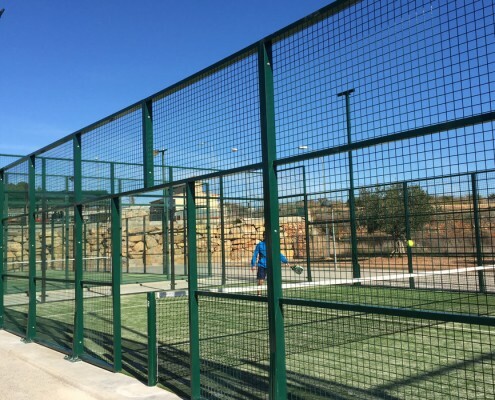 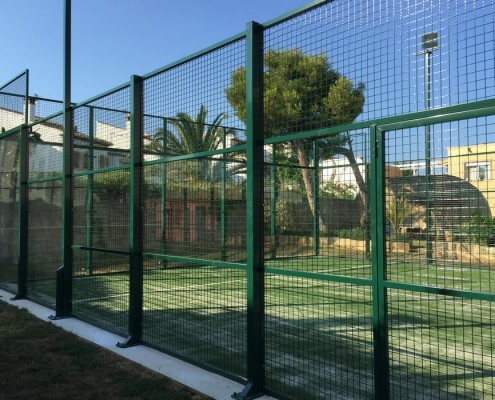 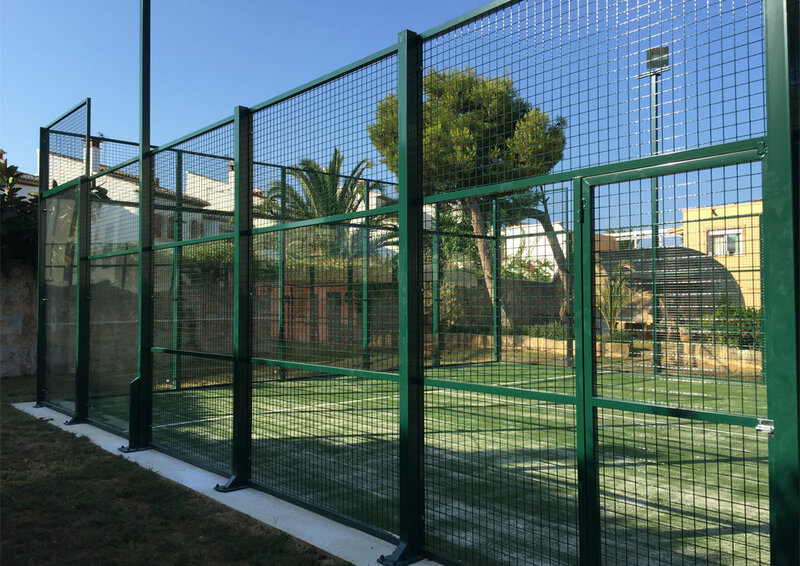 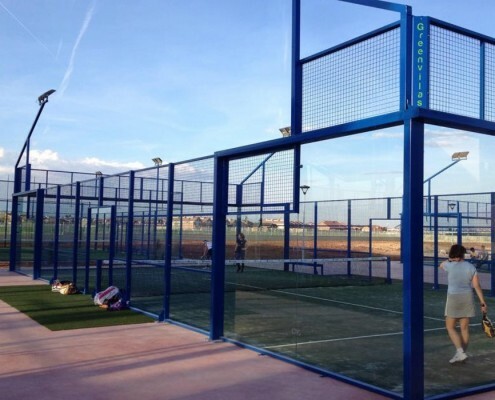 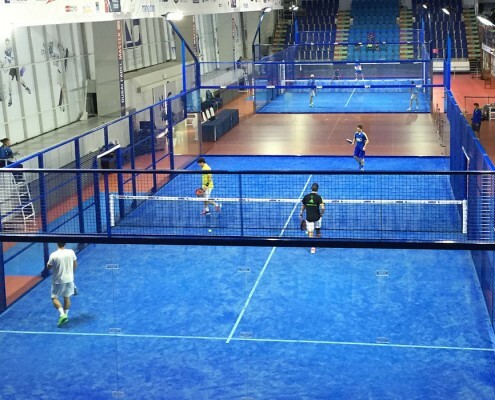 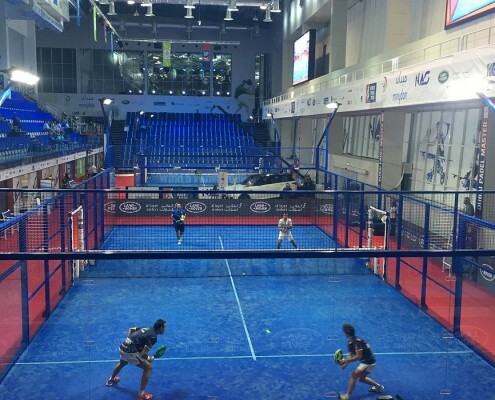 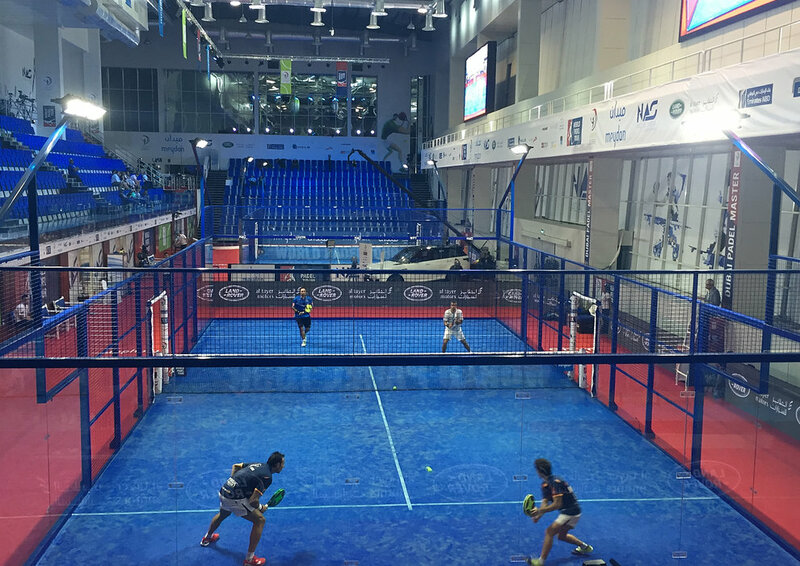 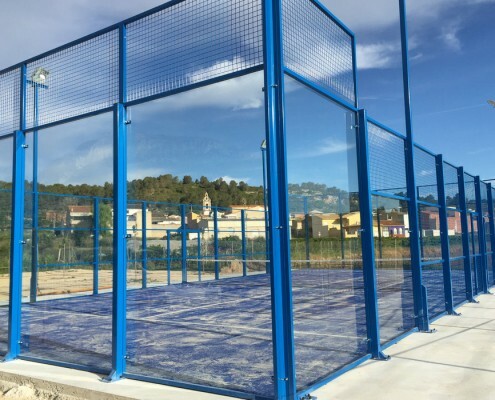 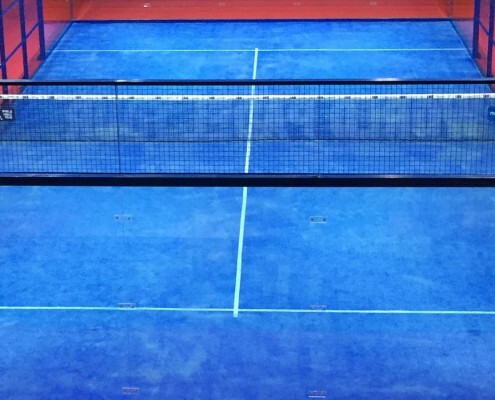 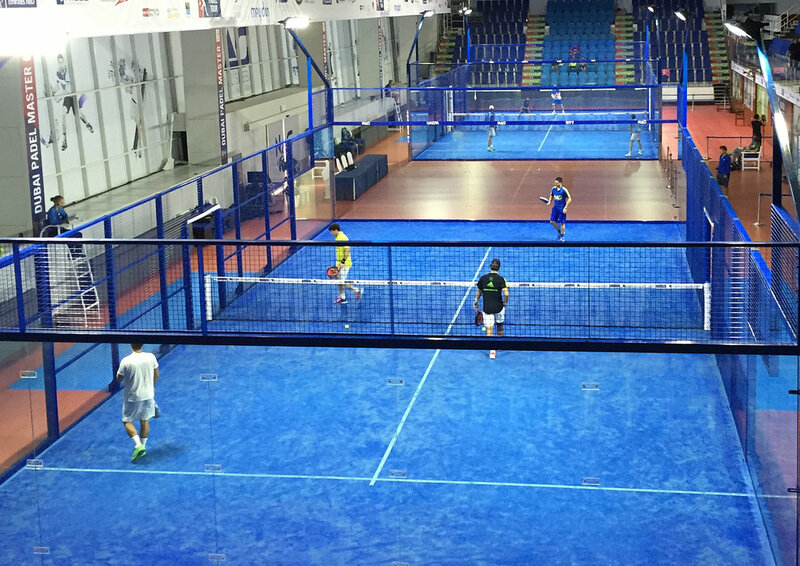 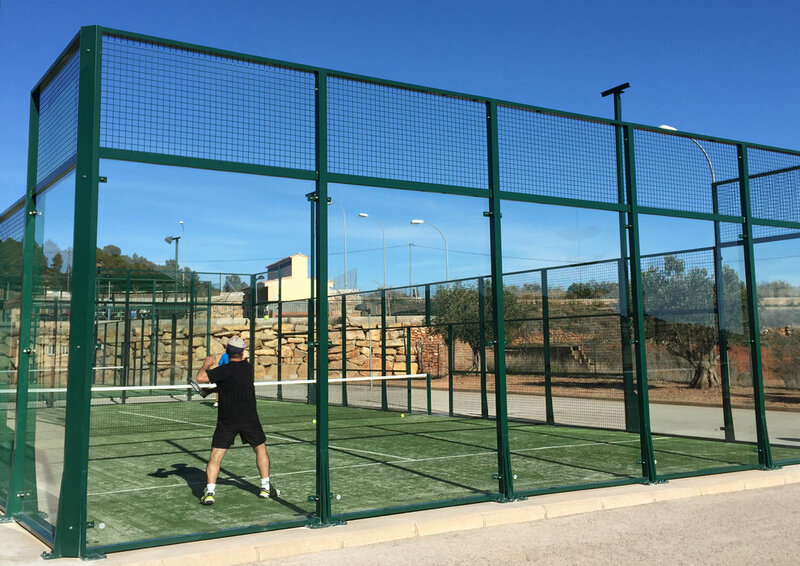 It is a low cost padel tennis court designed for those organisations (sports centres, padel tennis clubs, town halls), that are looking for a greater return on their investment, with a simple design that doesn´t lose the essence of padel. 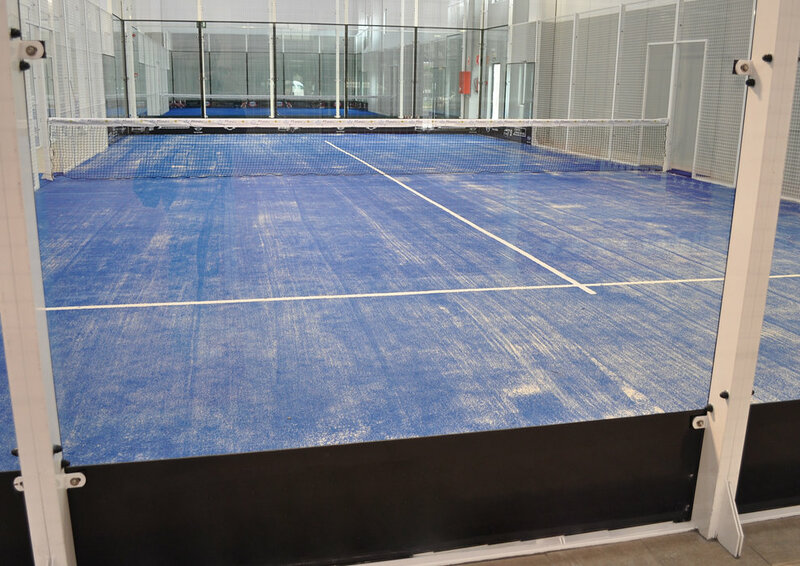 The pillar design of the court provides great stability, as each pillar adds reinforcement to give optimum wind and impact resistance, according to the CTE. 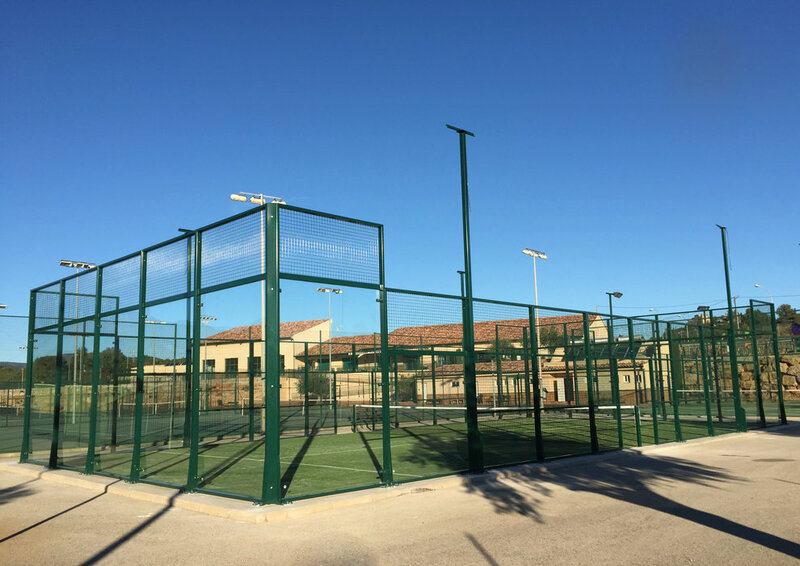 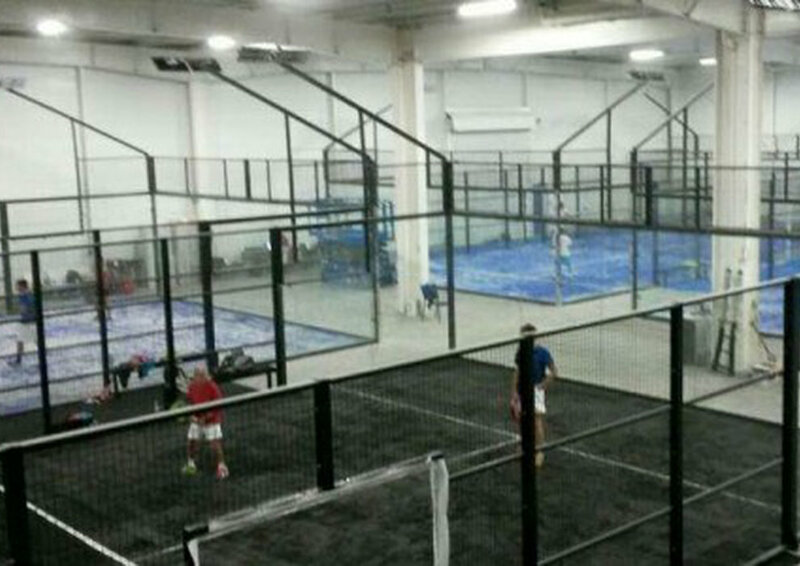 A special feature of this court is the welded mesh frames in PDS tubing , to cover all protrusions and prevent problems during play. 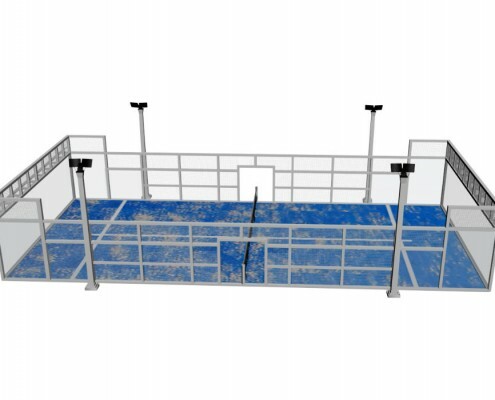 *Tubing of 100x50x2mm, reinforced at each 1 metre pillar with 80x50x2 tubing, with 200x200x10mm anchor plate hosting 4 x 16mm holes for the bolts. 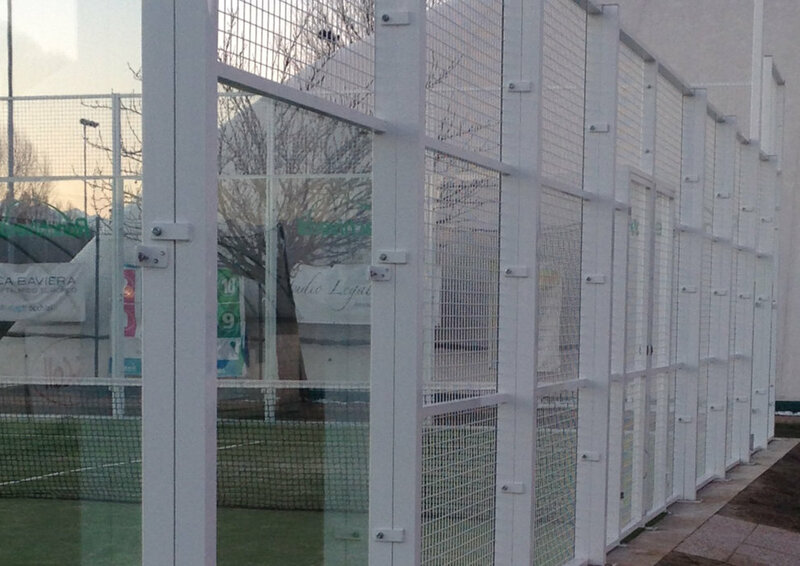 *In the glassed area, horizontal reinforcement joins the pillars at ground level giving greater impact resistance. 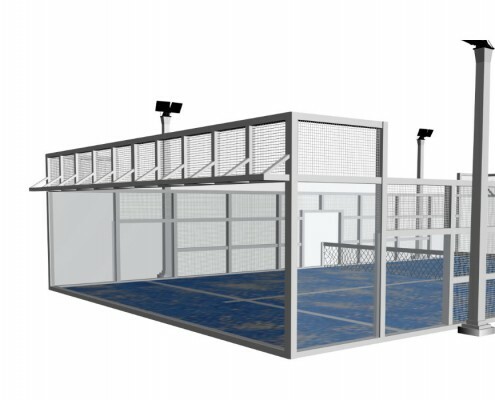 *Frame-based; it is the flagship model, a court designed for those clubs seeking excellence in their facilities. 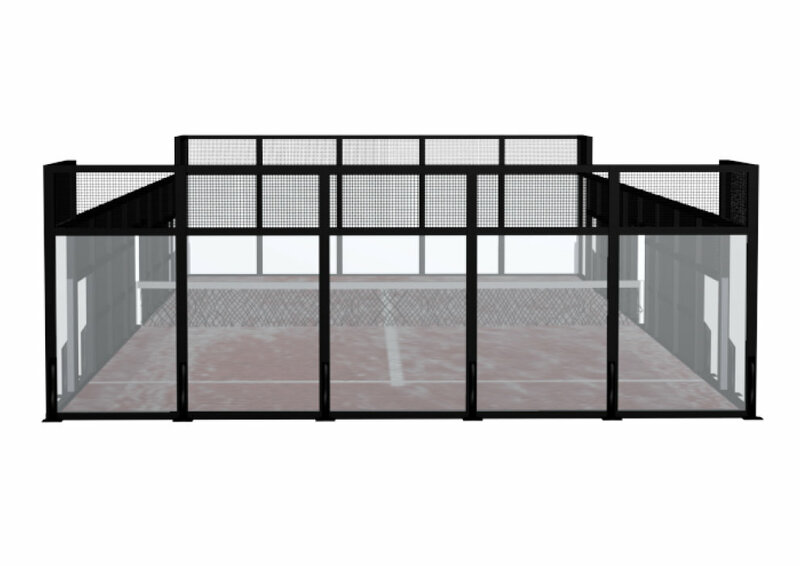 It has a self-supporting structure for easy installation and also to change location in the future if necessary. 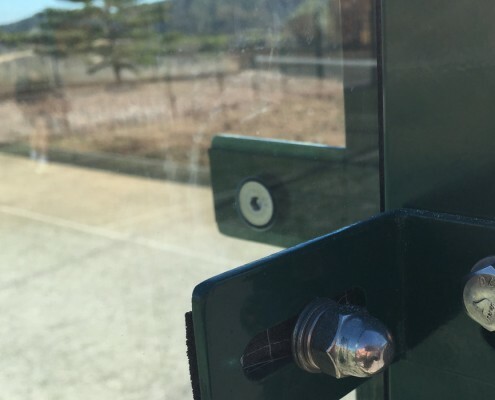 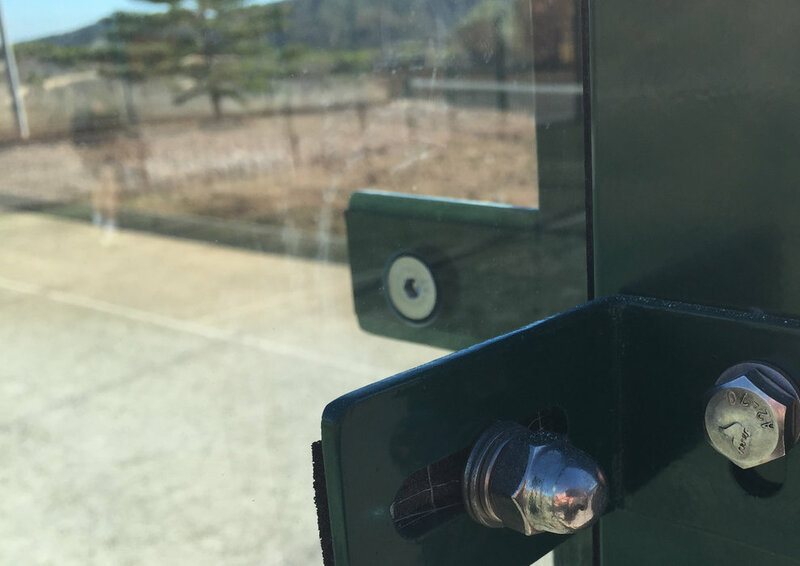 *A special feature is the double screw attachment in the glass frames, for increased resistance due to the impacts in that area and to comply with the CTE. 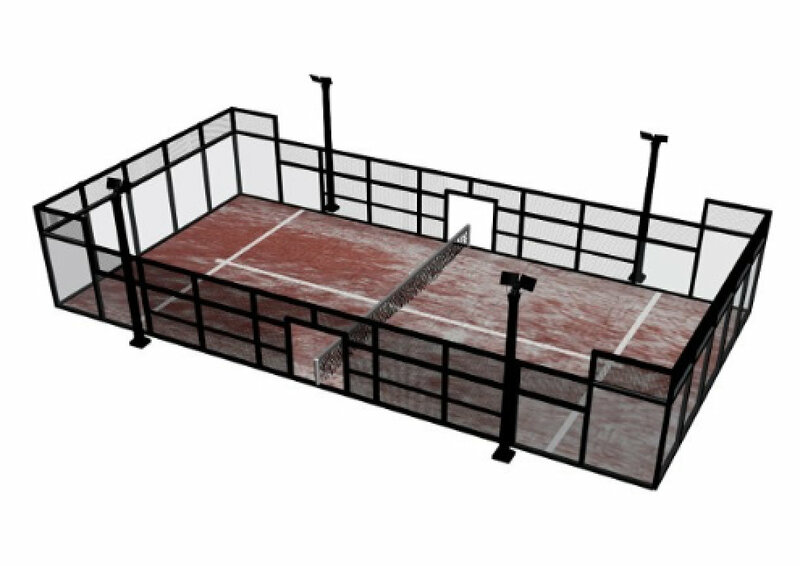 *As the design of the court is self-supporting, and does not require anchor plates, on many occasions it is used as a portable court. 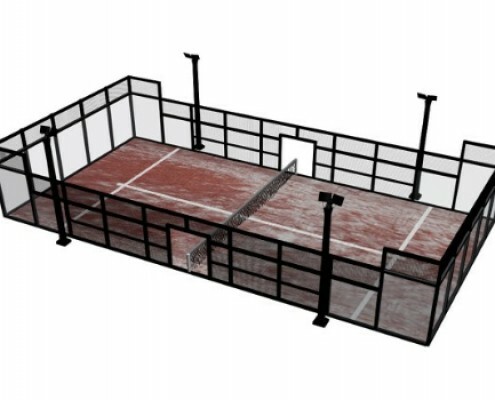 *Dimensions: 50 x 50 x 4, all ends have protective covers to prevent injury. 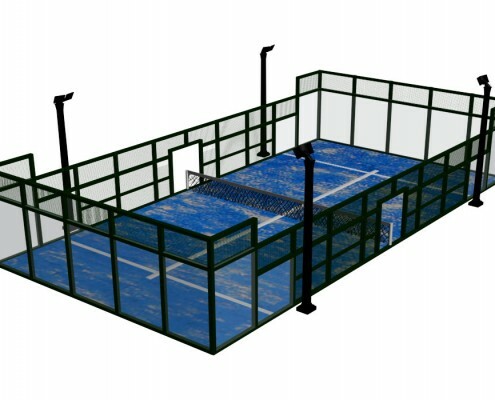 *Support tubing of 40x40x2mm at 1 and 2 metres to prevent warping. 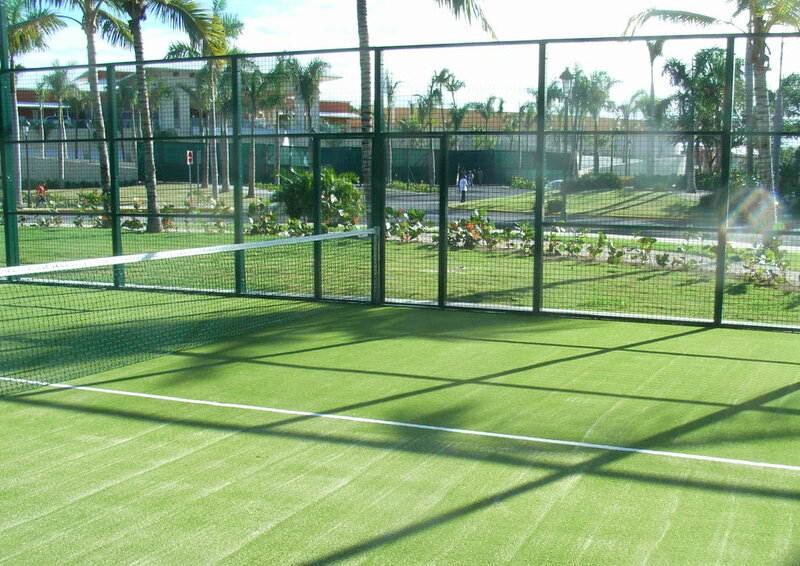 *For indoor and outdoor facilities. 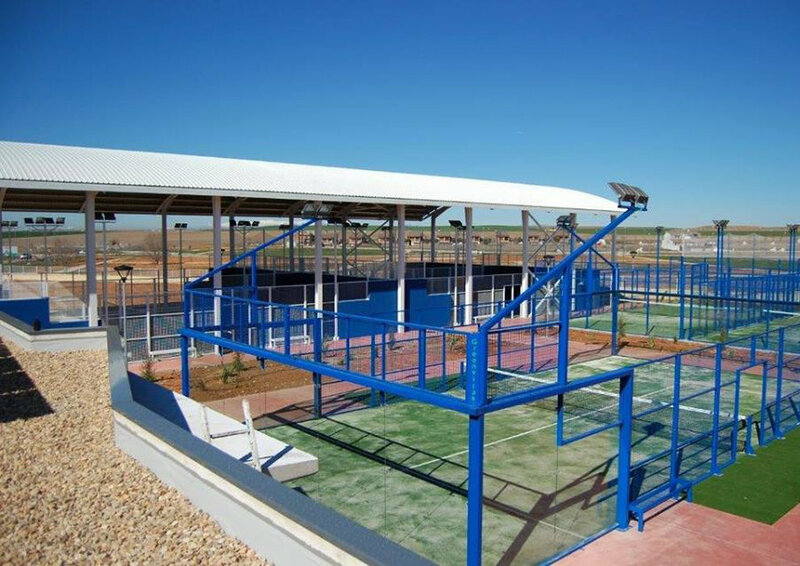 *Framework with 80x40x2mm tubing, Reinforcement pillar at each joint with 80x80x2mm tubing, forming a 160×80 pillar. 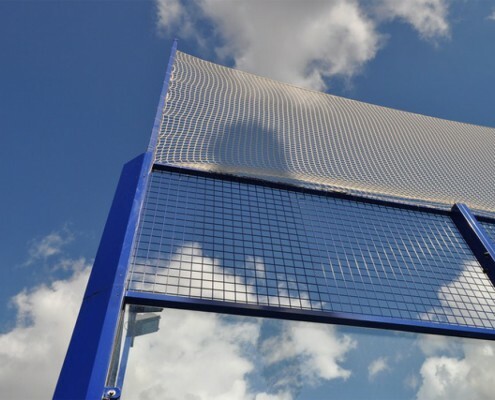 Each pillar has a 200x200x10mm anchor plate, with 4 x 16mm holes forming a reinforced triangle shape. 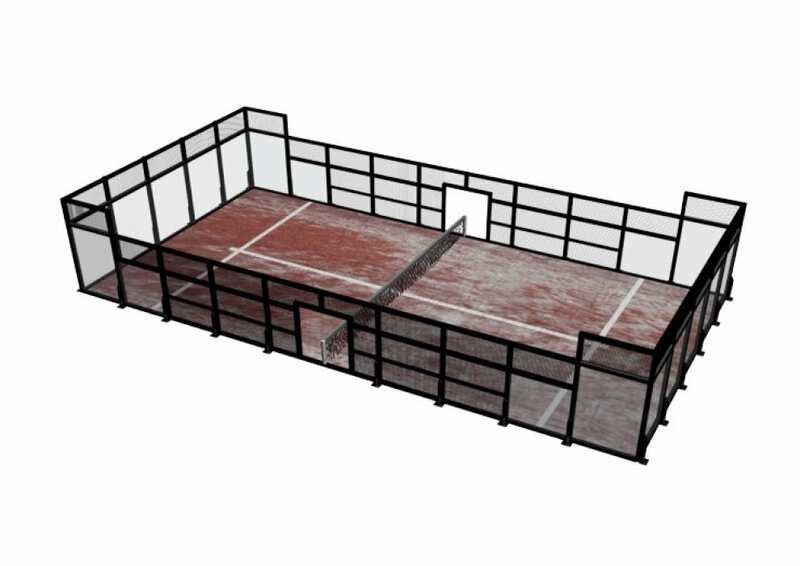 *Dimensions: 50 x 50 x 4, all ends have protective covers to prevent injuries. 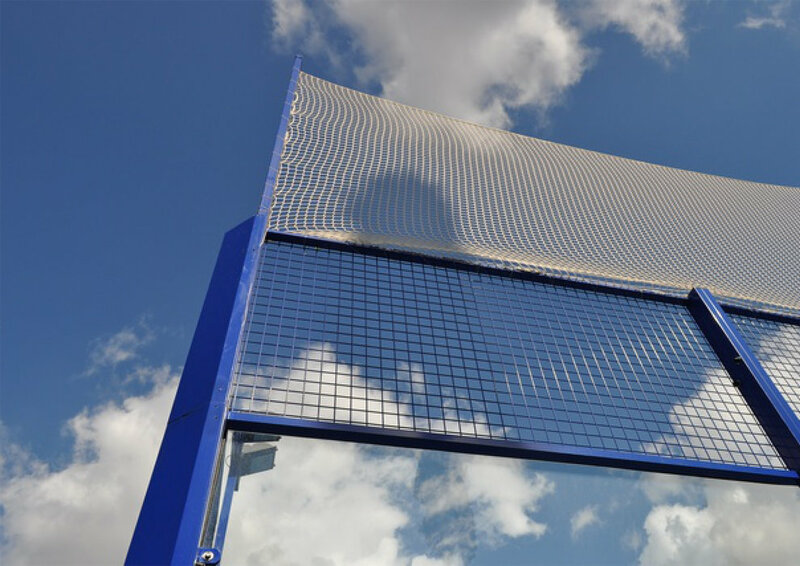 *Especially for areas with strong winds e.g. 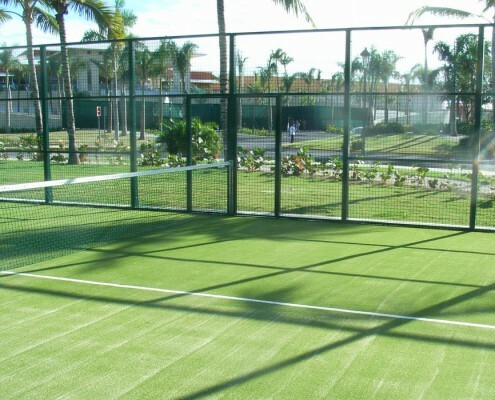 near the sea. 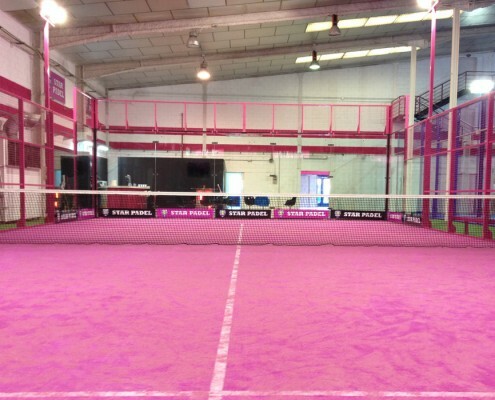 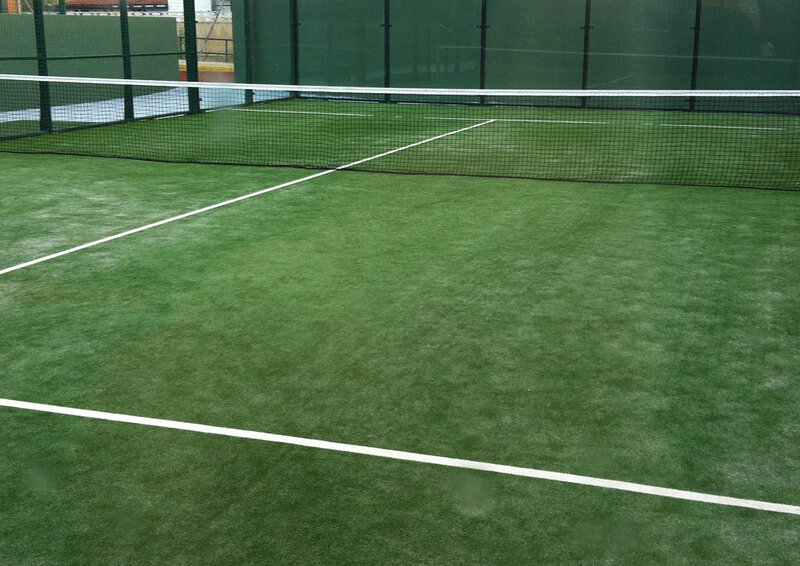 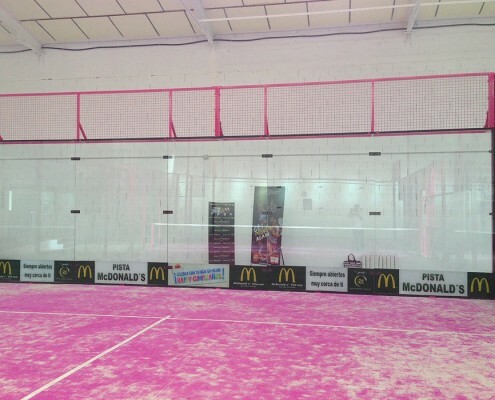 Using the Pro model as a starting point, this court is designed for clubs and spectators. 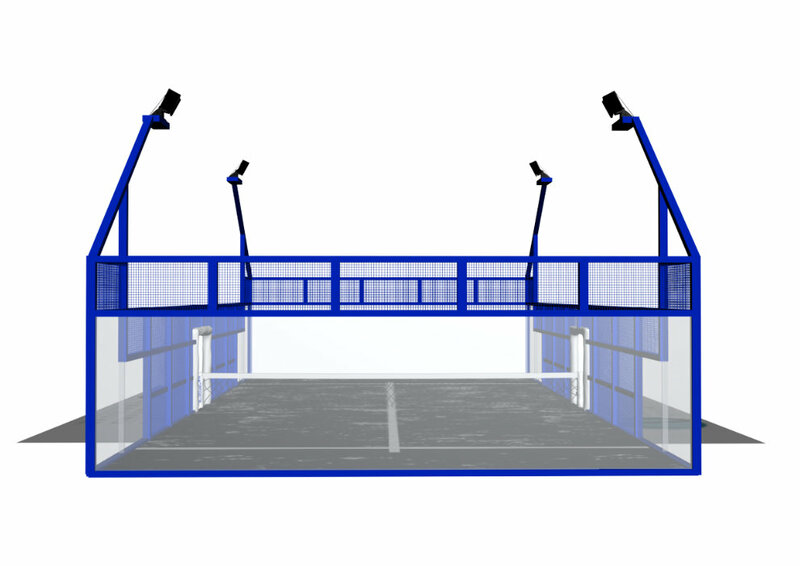 It is a simple structure providing excellent views for spectators. 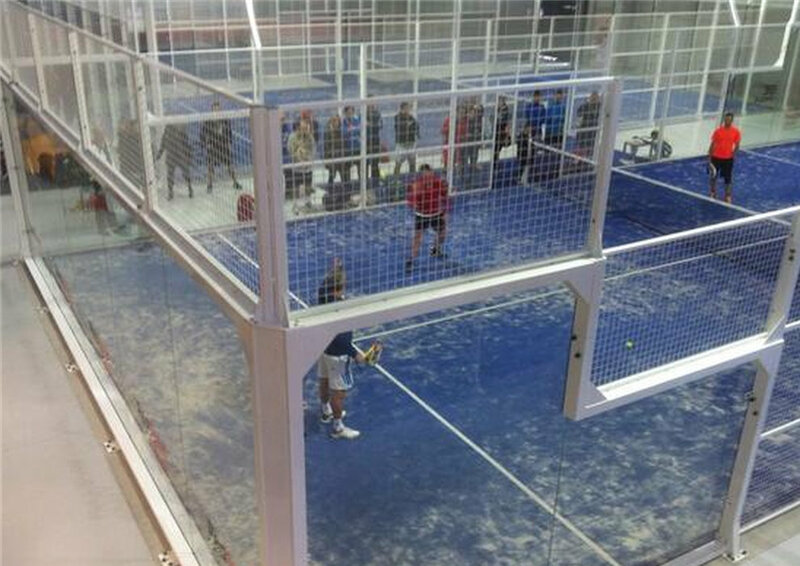 A court with wide glass panes at its ends, with no pillars or tubing to block views of the action. 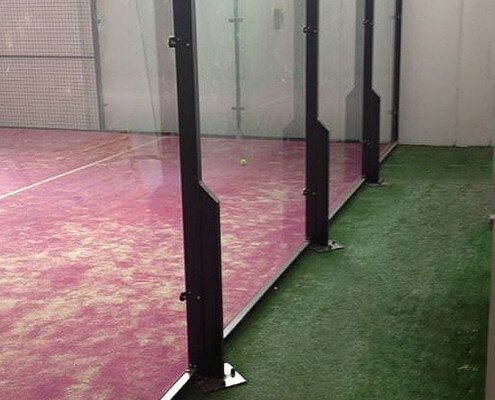 Widely used as a centre court in clubs holding events or competitions. 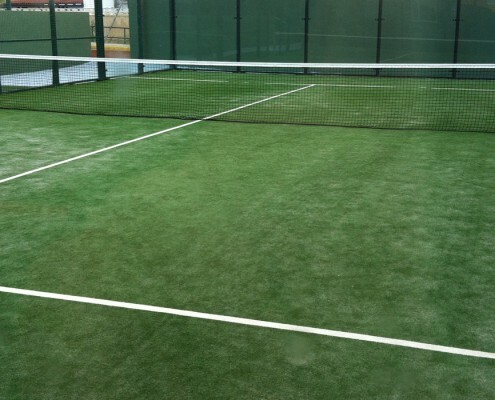 *The sides of the court have 80x40x2mm tube framework, each with 2 x 250x100x10mm anchor plates with 3x 16mm holes forming a reinforced triangle shape. 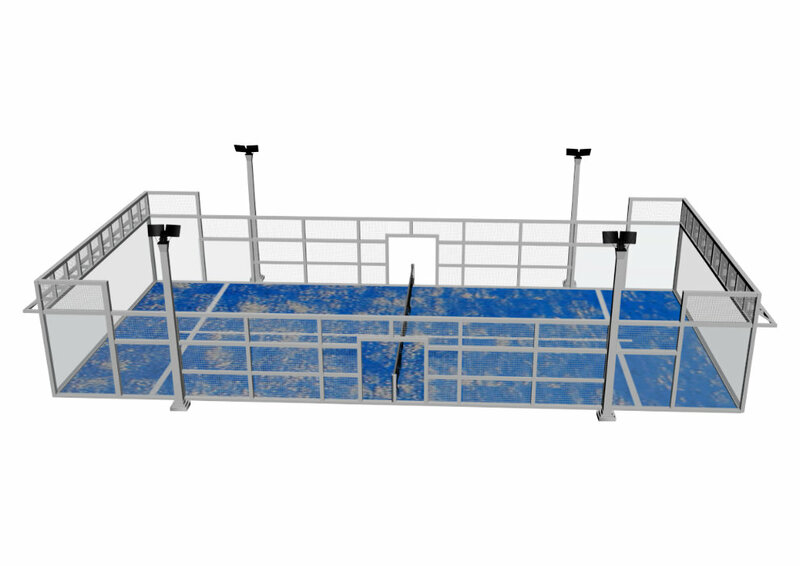 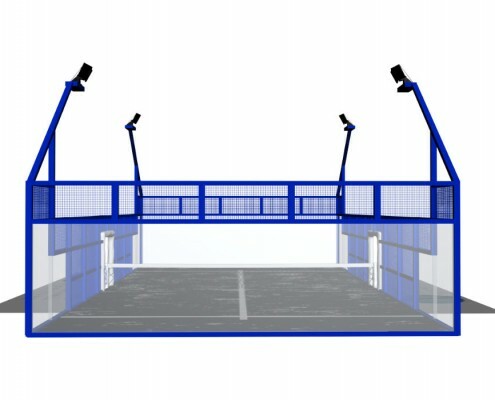 *The ends of the court have 2 x 5m pieces joined together with 80x40x3 and 40x40x2 tubing, bearing the strength of the structure and the different impacts. 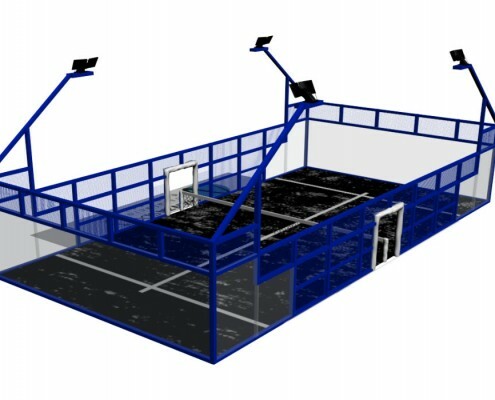 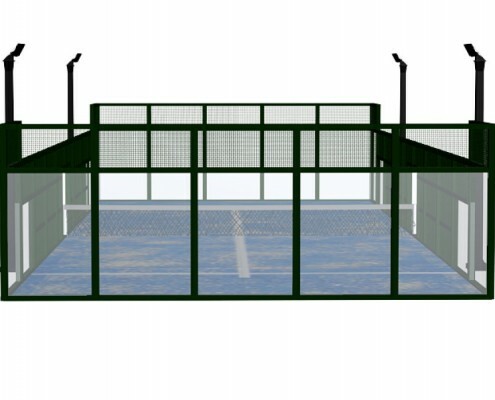 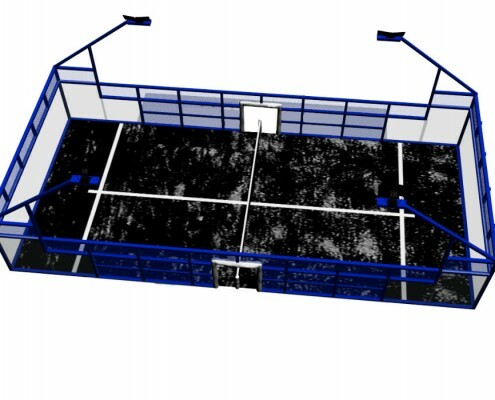 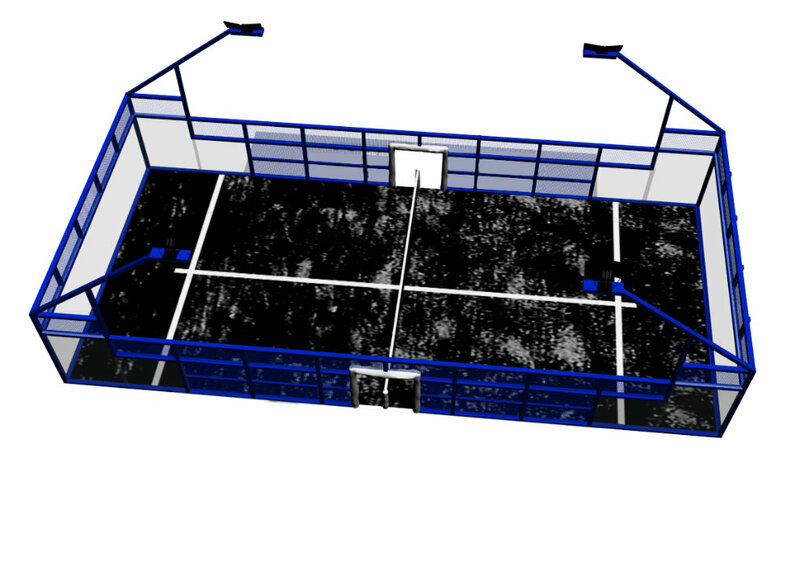 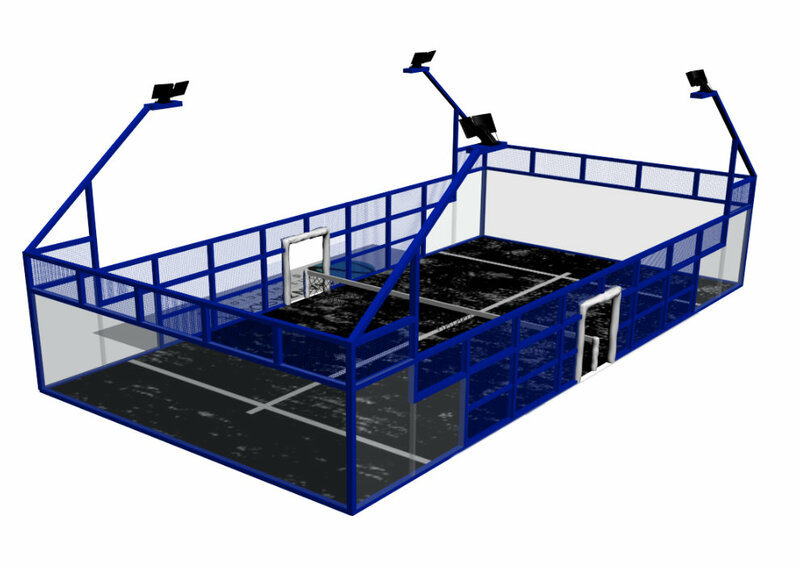 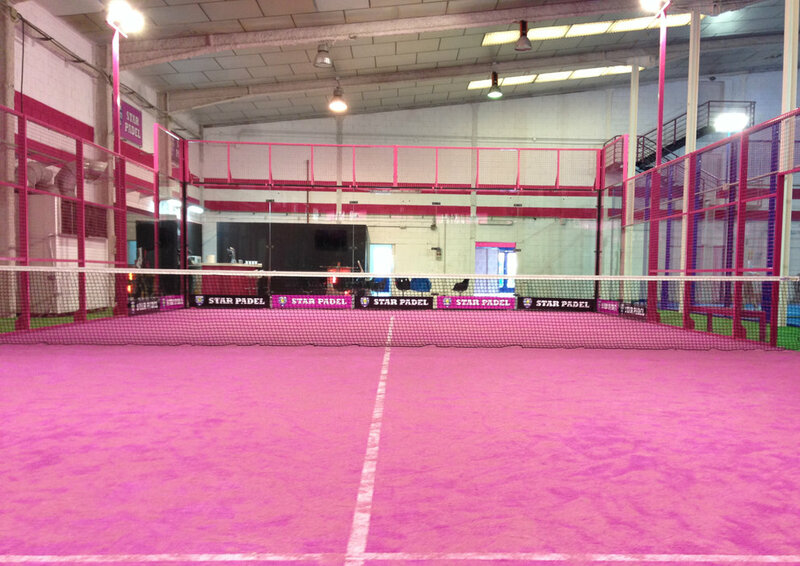 This special model of court is different from other padel tennis courts in that it was designed from the view point of the players and spectators. 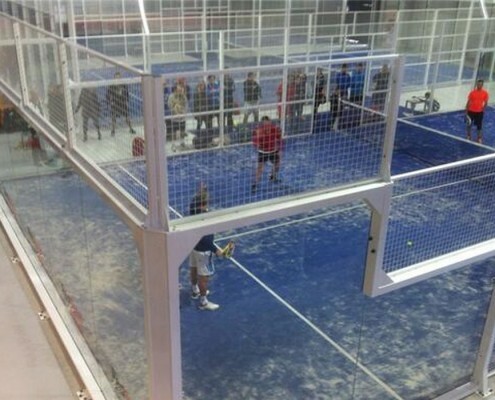 This open court has no blind spots, so the spectator misses none of the action of the game. 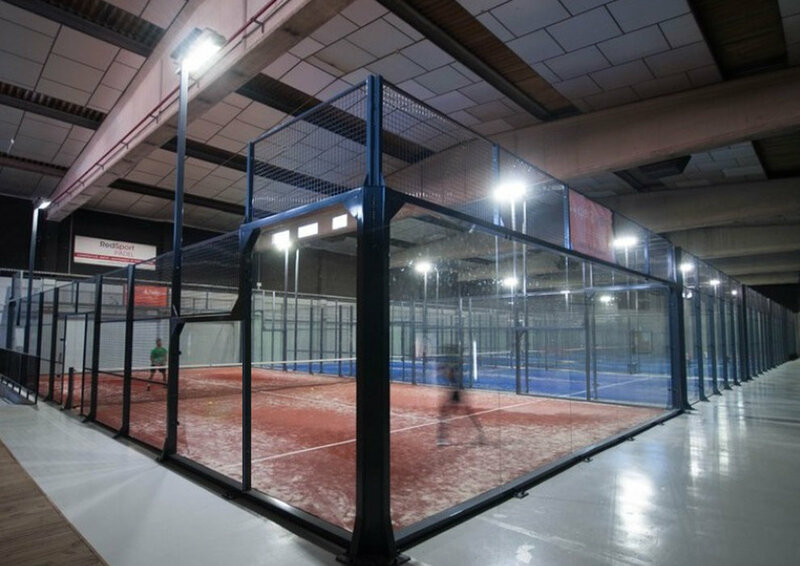 Normally this comes with our patented lighting system, ensuring a padel tennis court where the best games will be played. 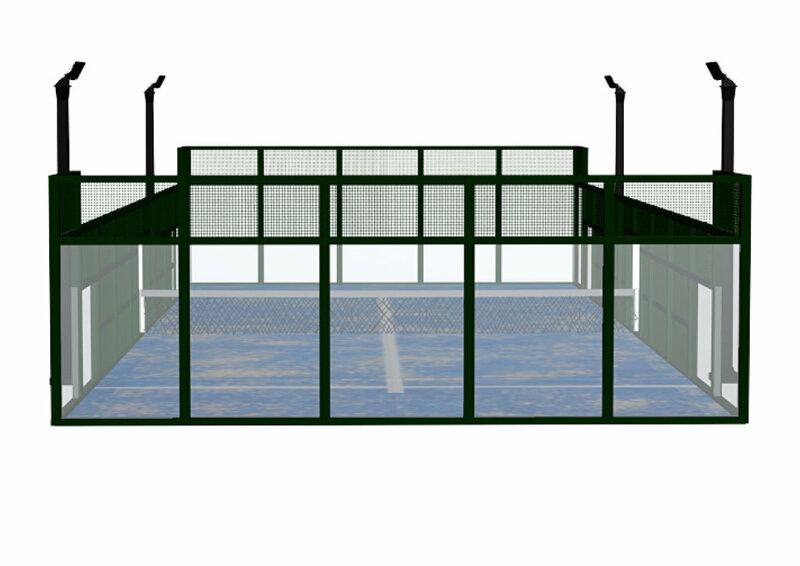 This court design is for the professional padel tennis player – sleek with many options to customise to your needs. 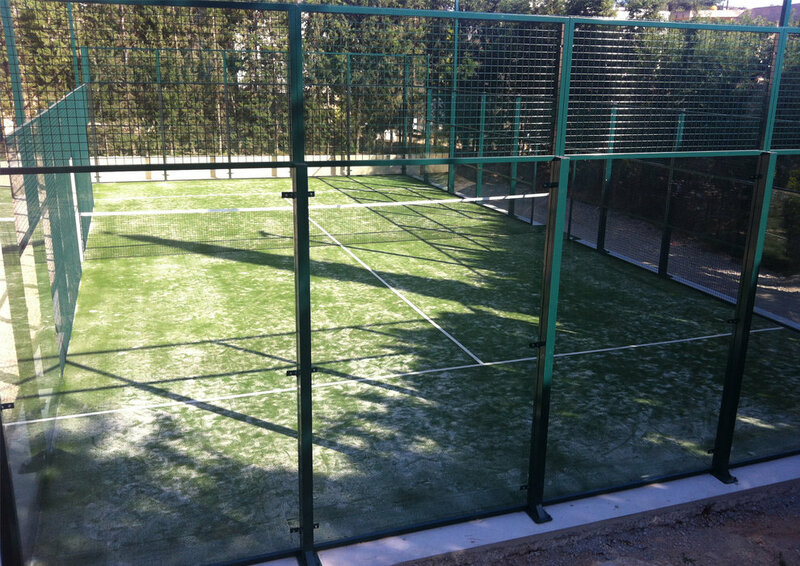 *Framework with 100x40x2mm tube. 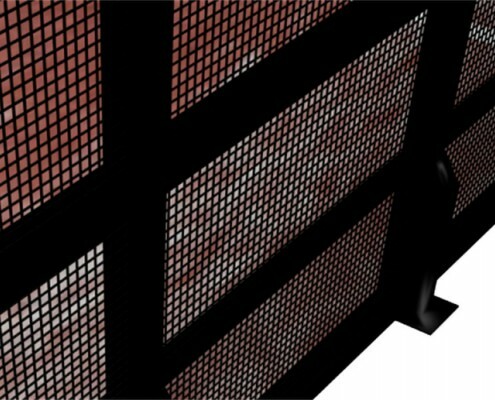 Each frame has 2 x 250x100x10mm plates with 3 x 16mm holes forming a reinforced triangle shape. 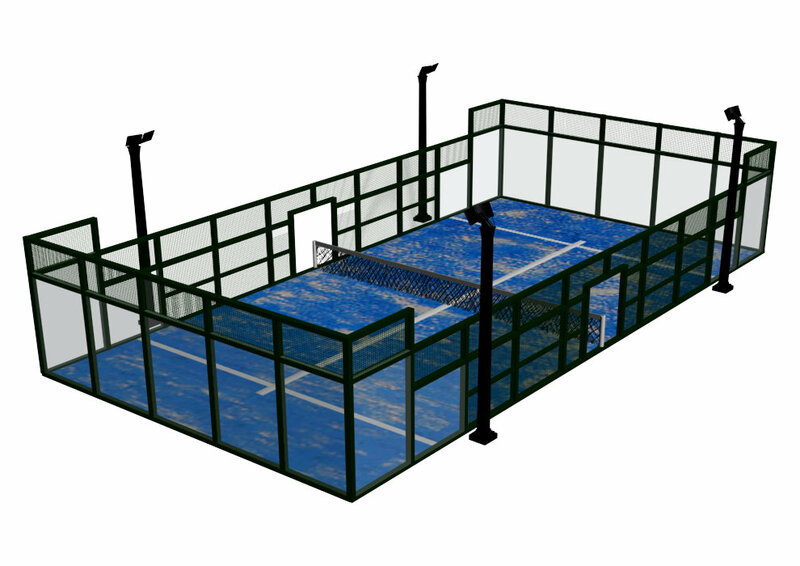 *Support tubing at 1 and 2 metres to prevent warping. 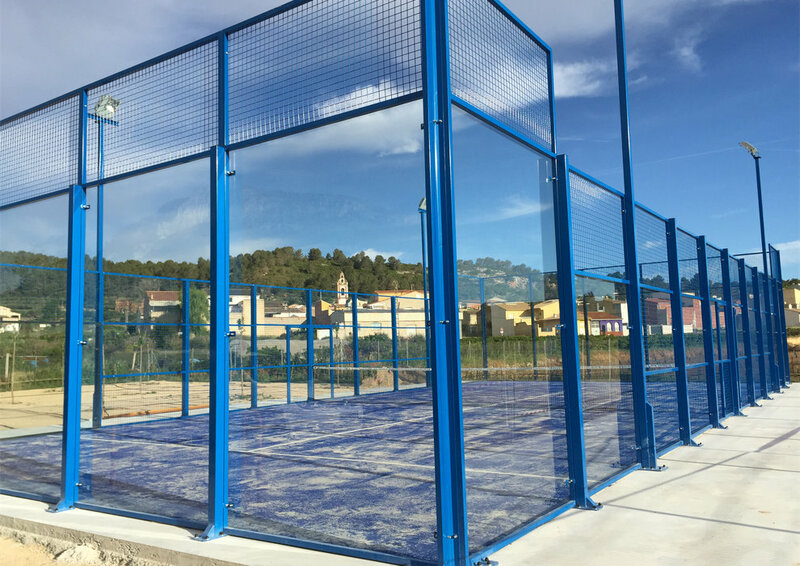 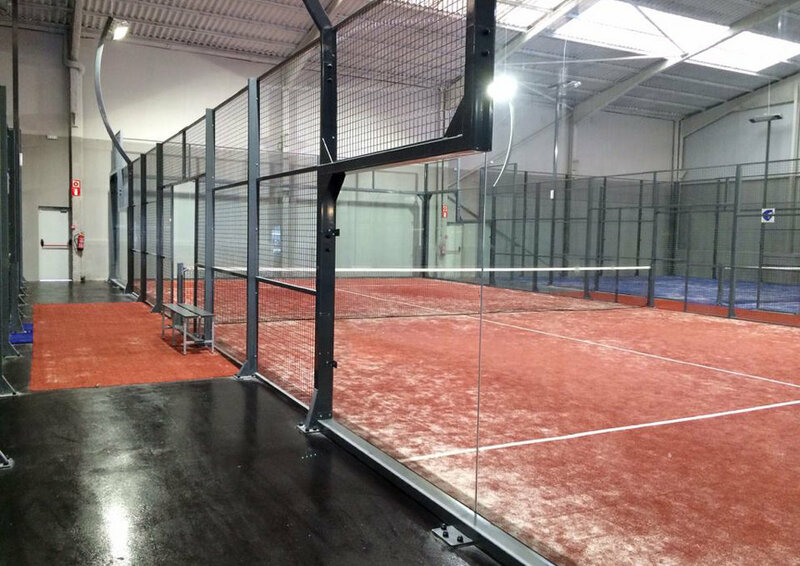 The single padel court is a solution for spaces that do not meet the regulatory measurements for the construction of a normal padel court. 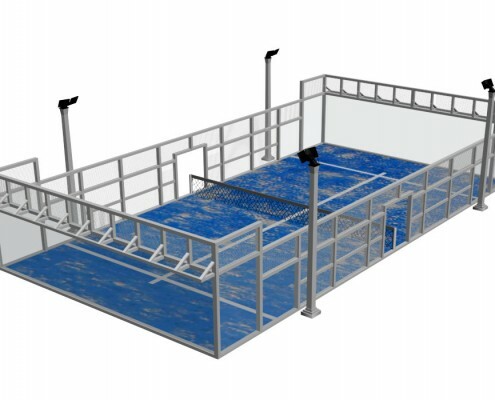 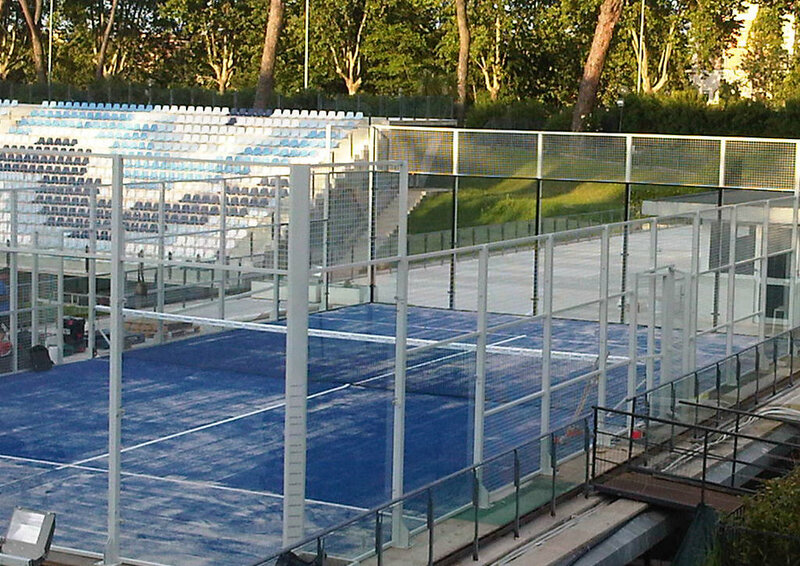 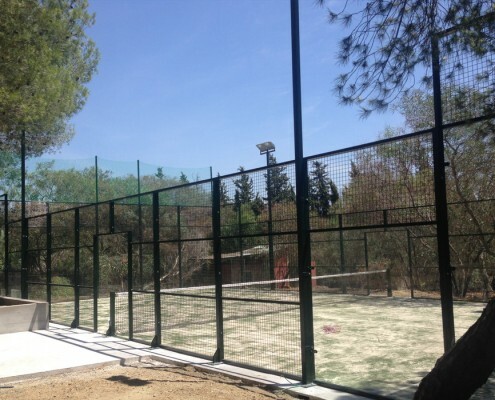 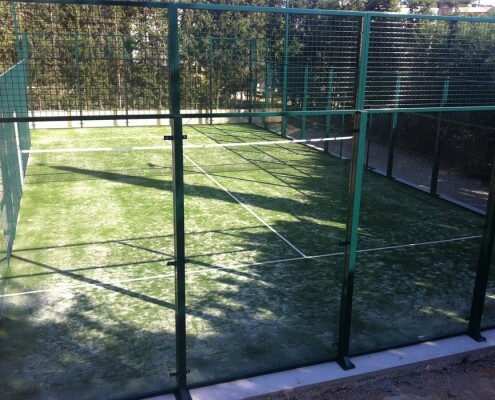 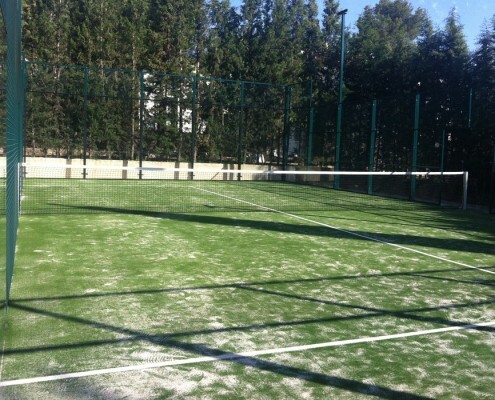 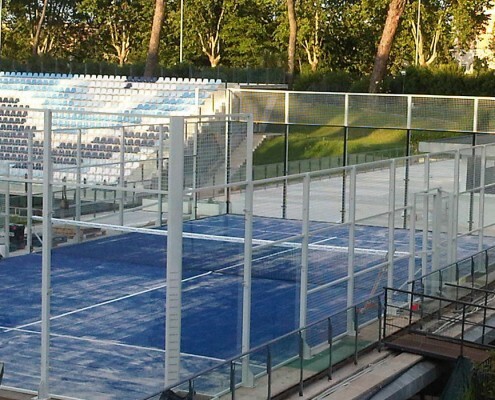 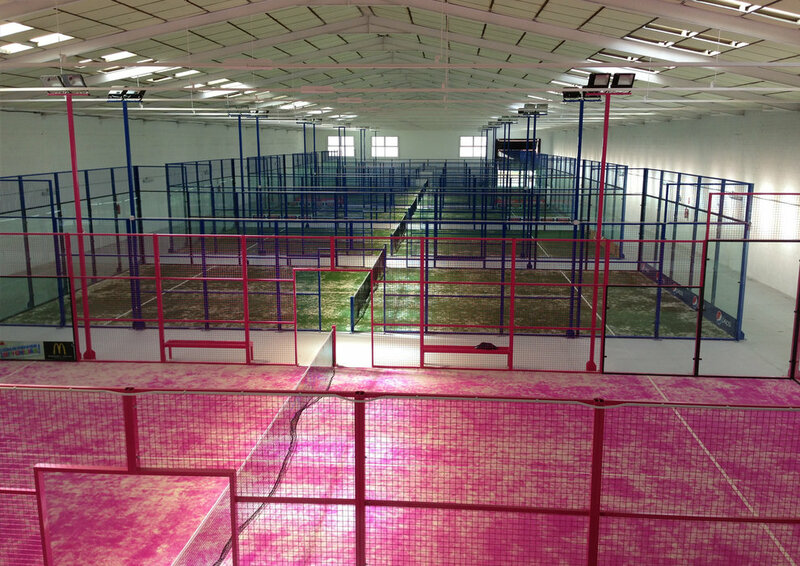 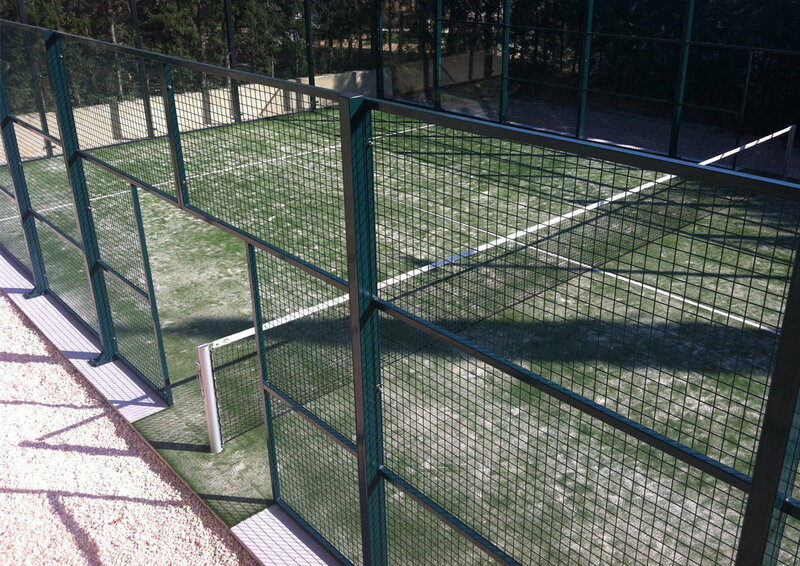 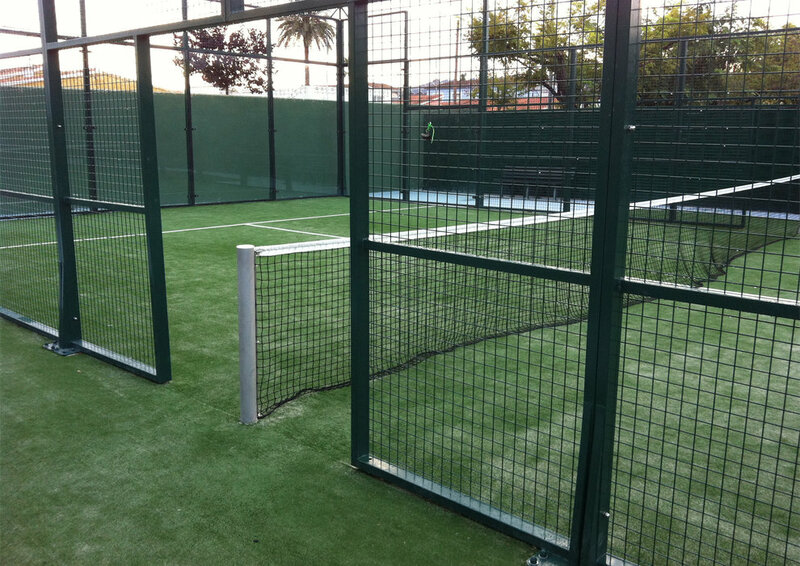 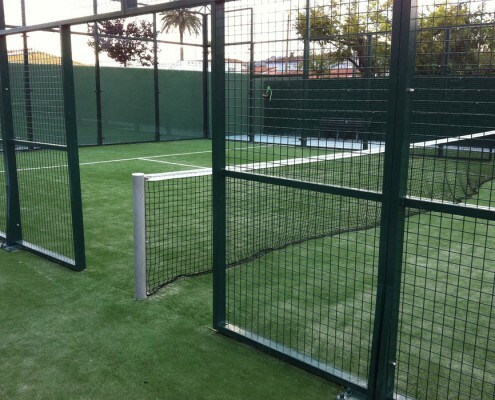 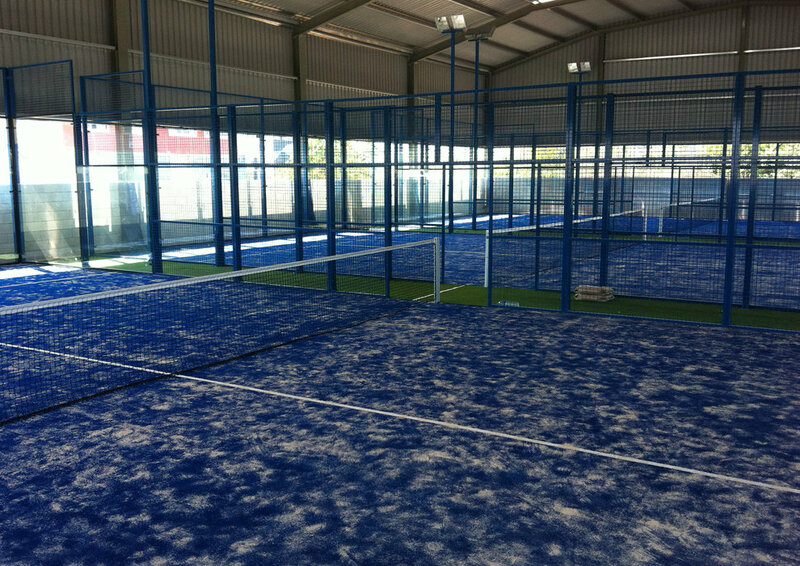 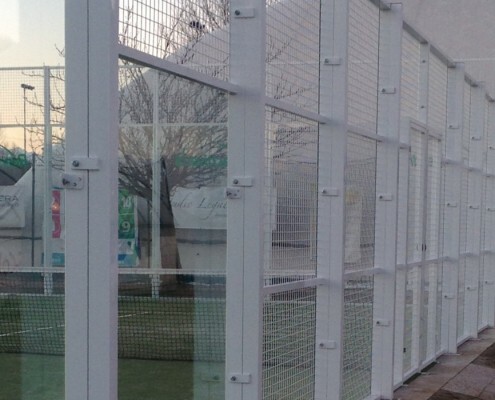 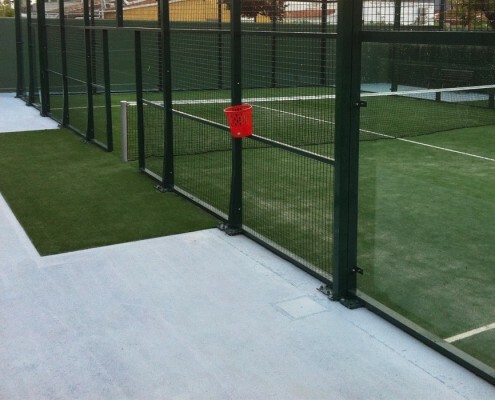 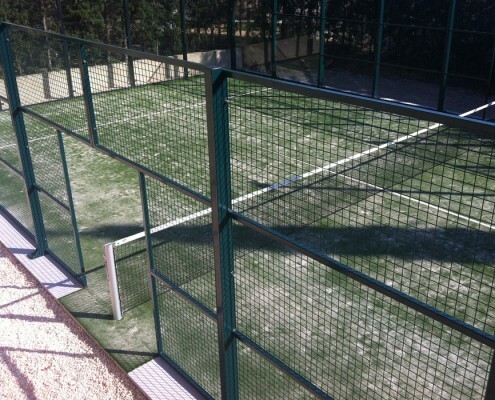 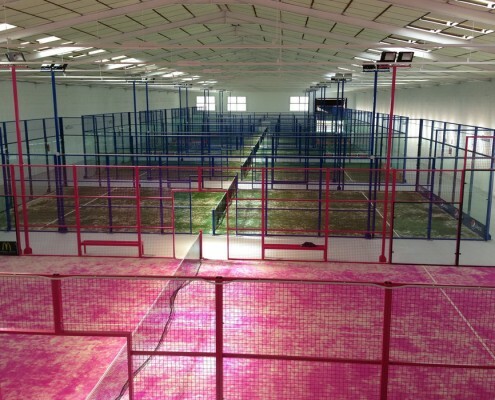 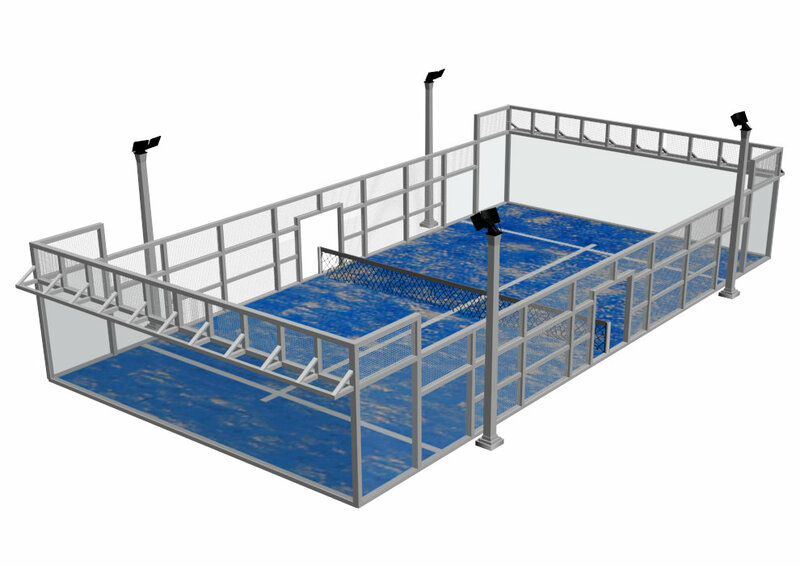 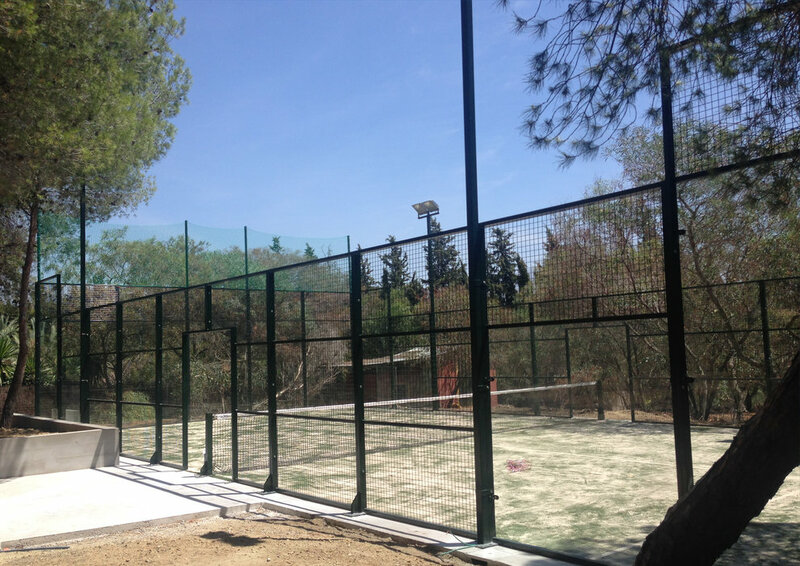 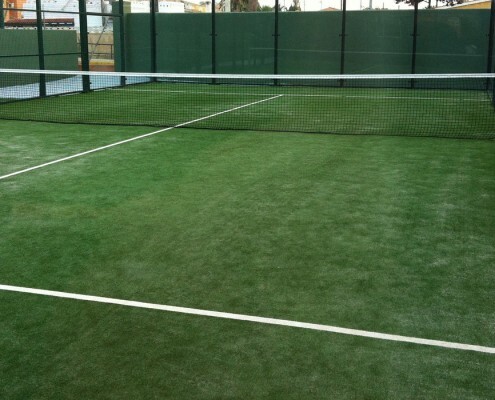 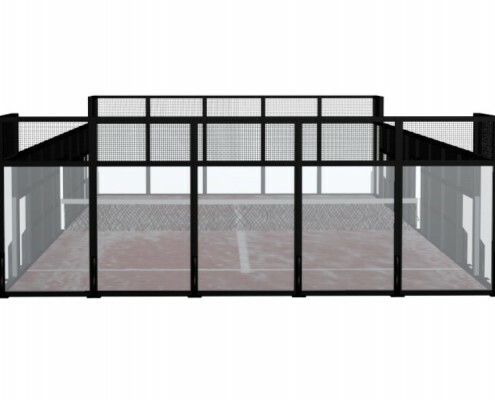 It provides for the installation of a padel court of 20x6m. 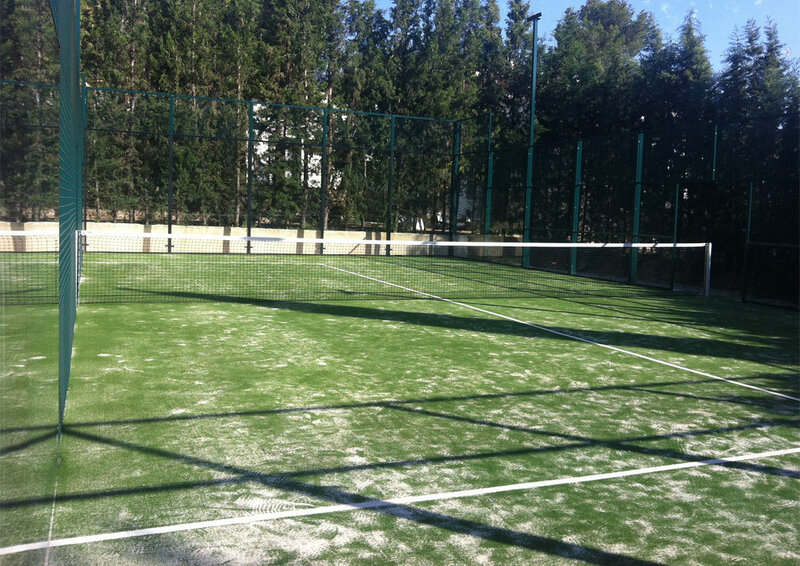 It is similar to the Pro model but with a 120×2 playing surface. 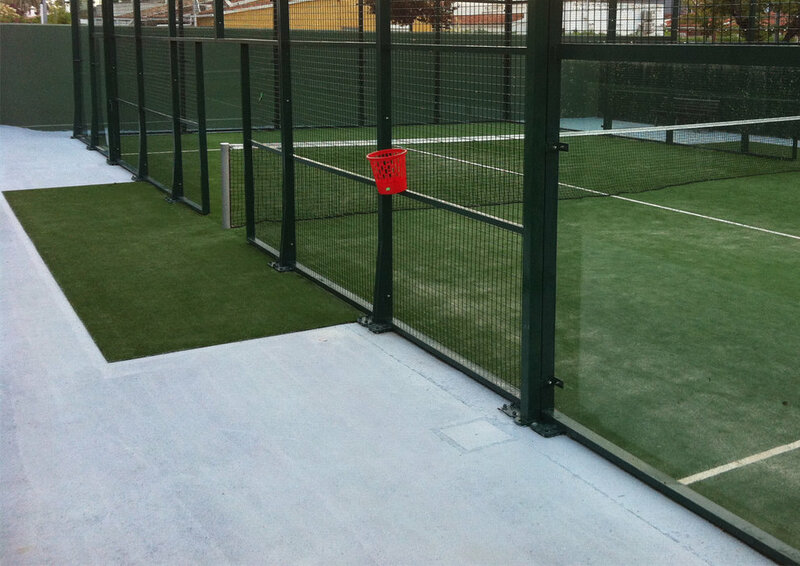 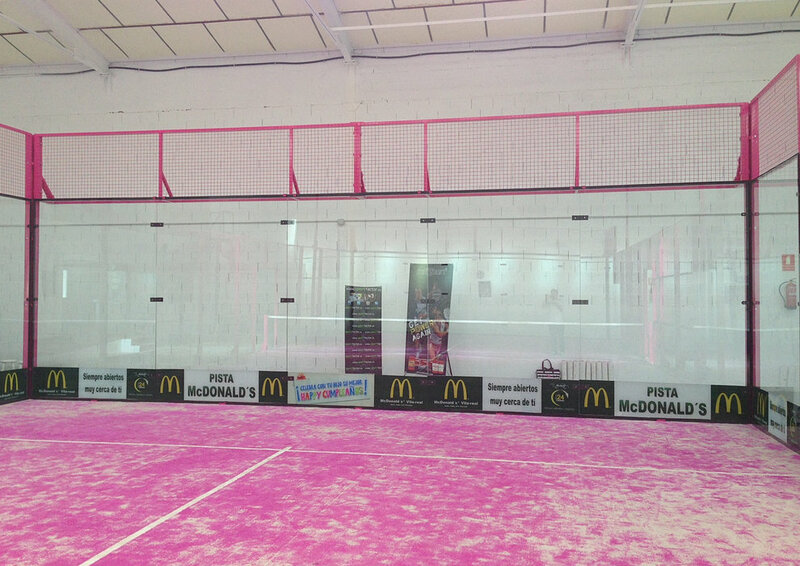 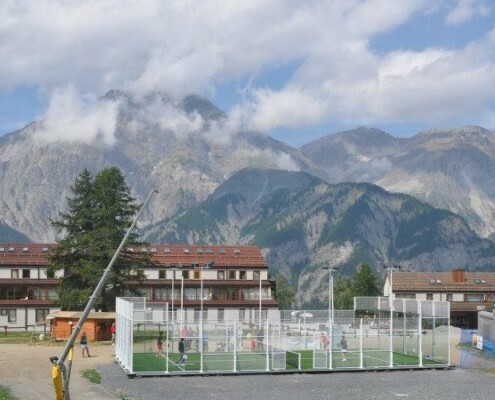 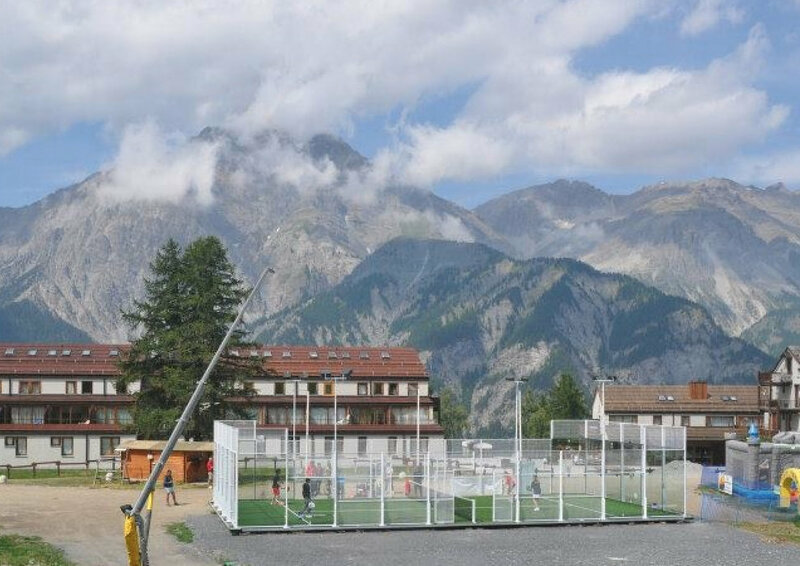 It´s a great court for training and for children and their parents to play. 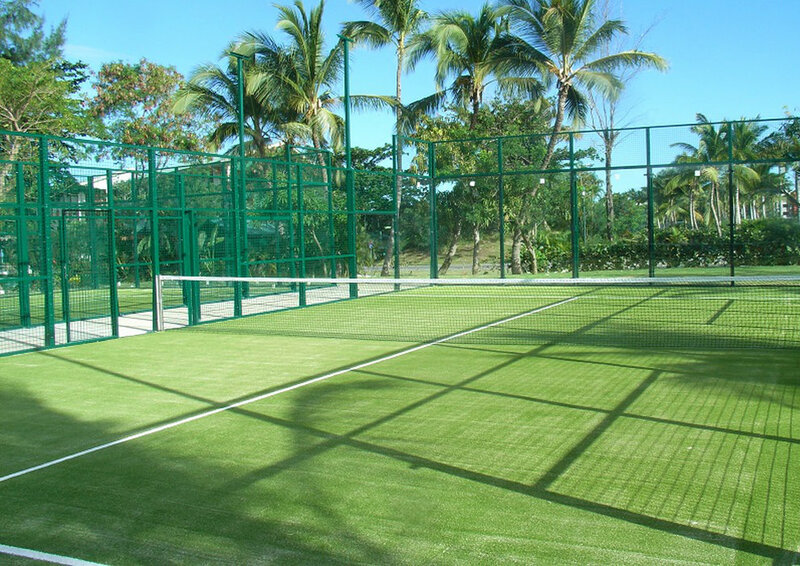 Here at Eligrass we like challenges. 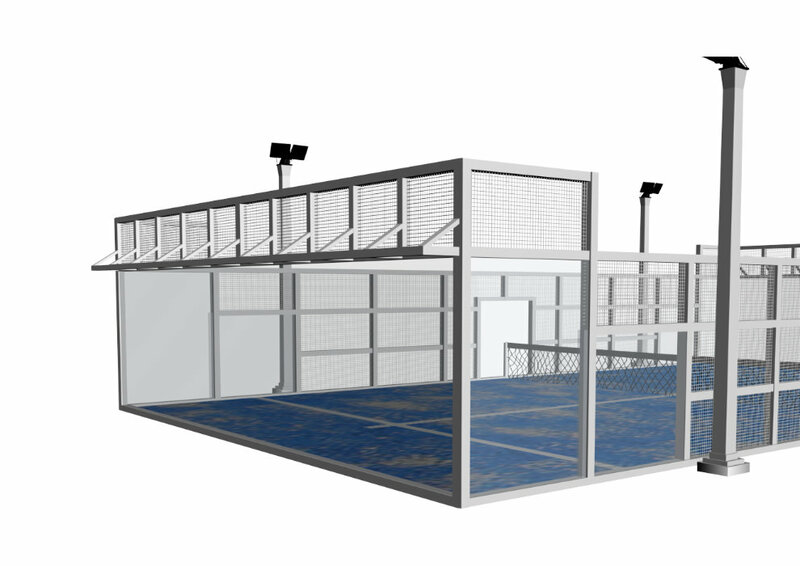 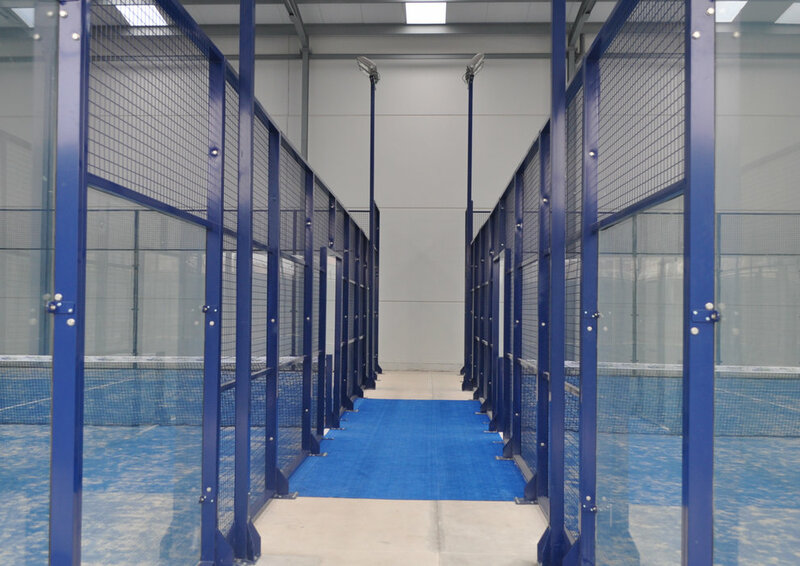 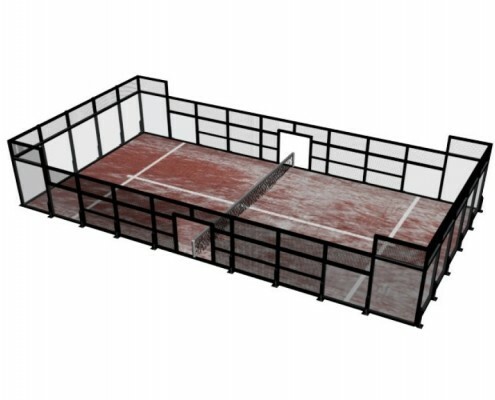 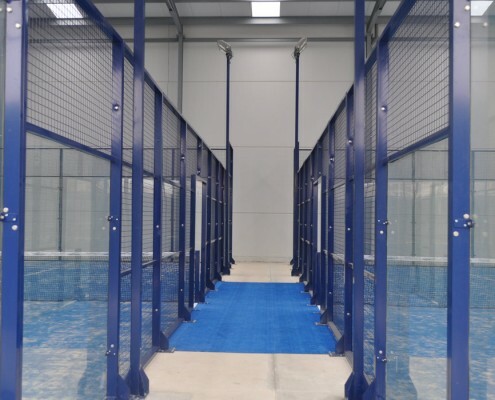 So, whether due to space requirements or because you like certain structural features, if you propose a customised court we can develop it and make it happen.